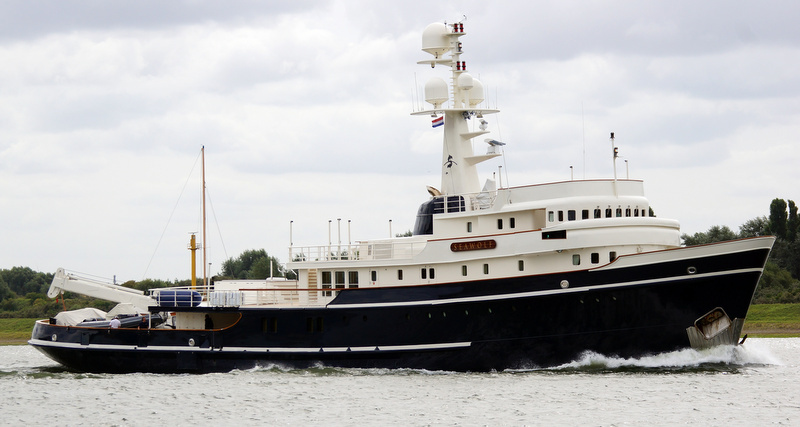 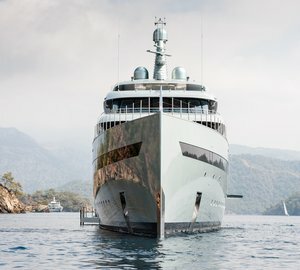 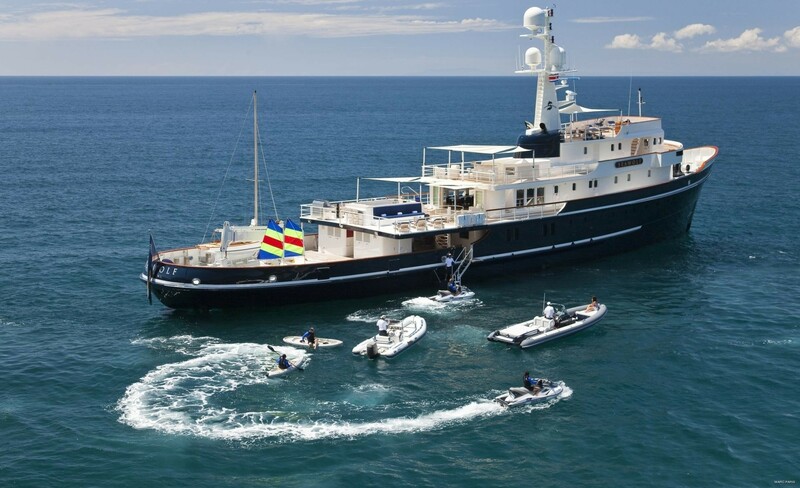 Luxury motor yacht SEAWOLF is a full displacement steel hulled 58m (193') expedition (explorer) yacht which was originally built in Holland by JK. 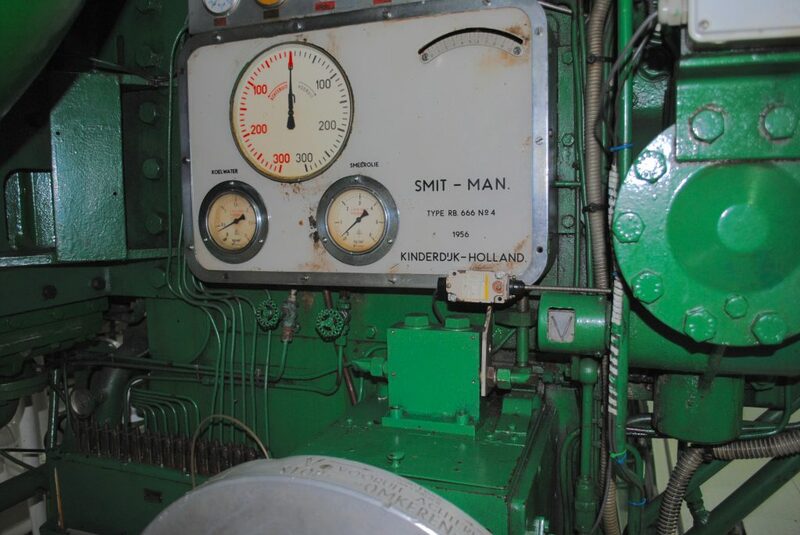 SMIT, in 1957. 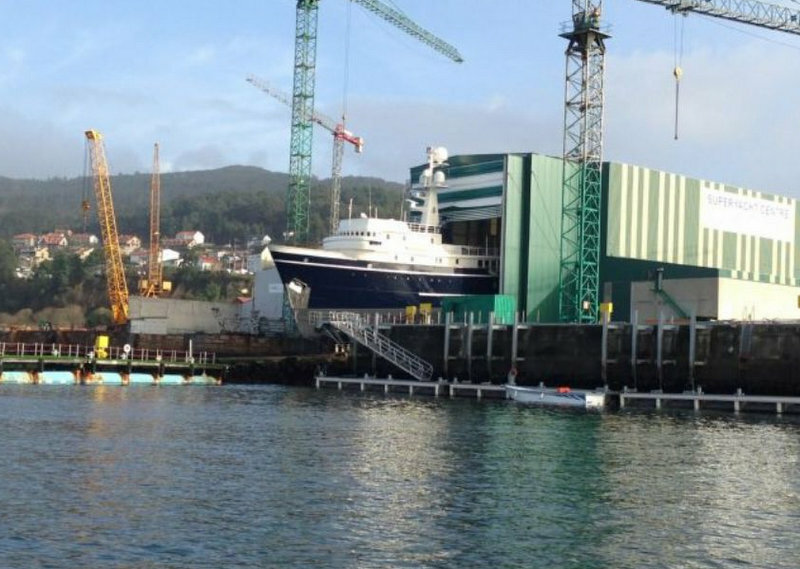 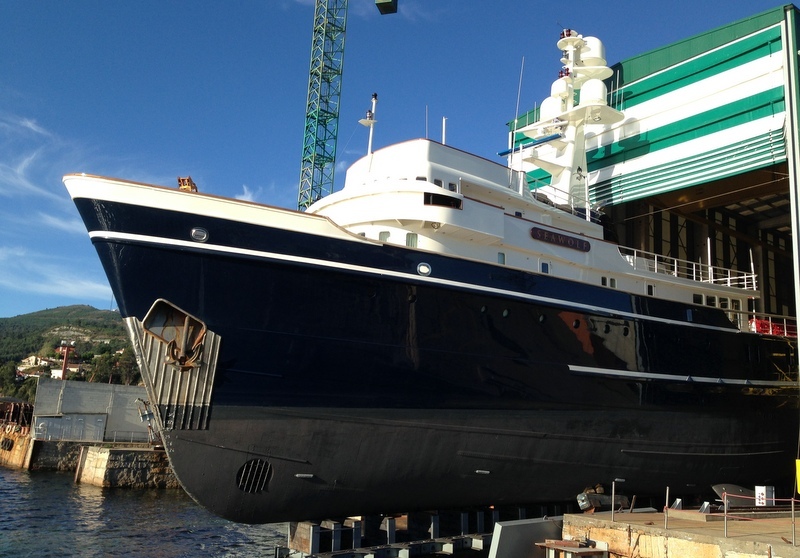 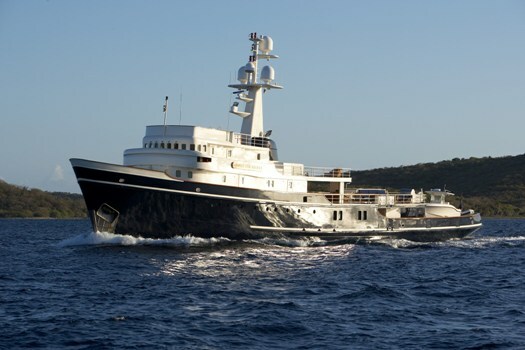 In 2002 she underwent a full conversion to become a private motor yacht, and she has since been refitted further in 2006, 2012 and 2013. 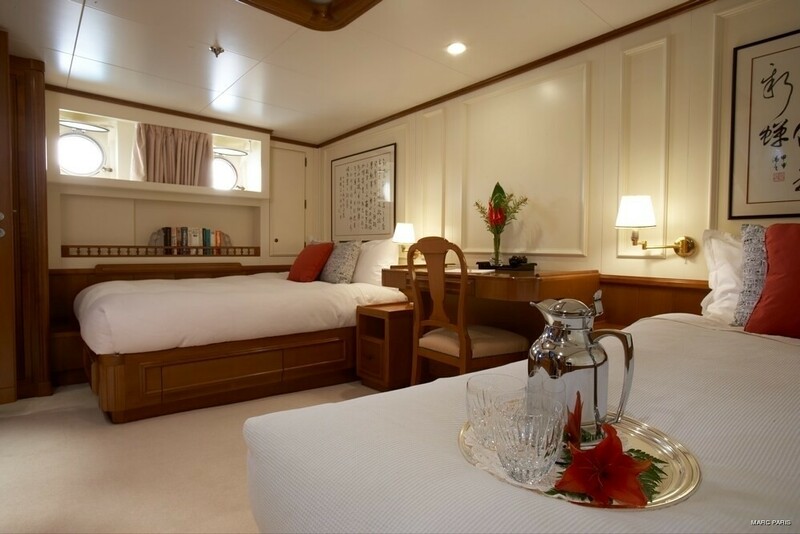 She provides an extremely stable, strong and safe platform for up to 12 charter guests in 6 cabins when exploring the world’s beautiful waterways. 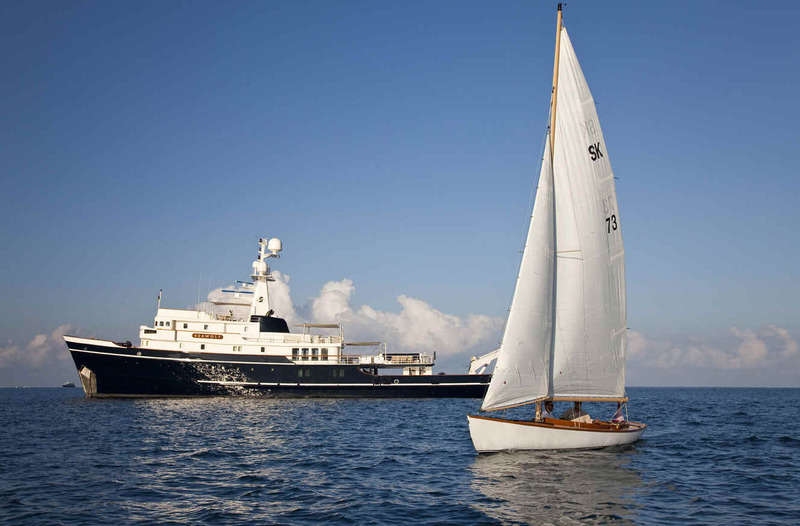 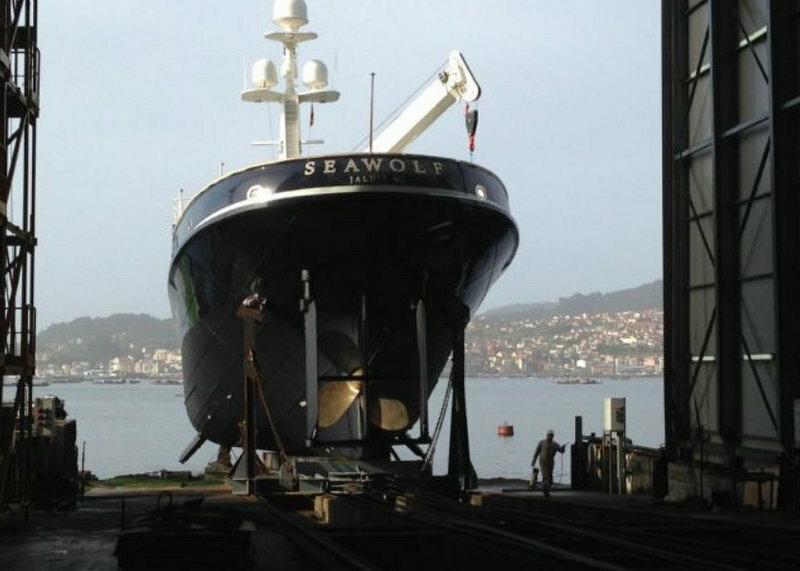 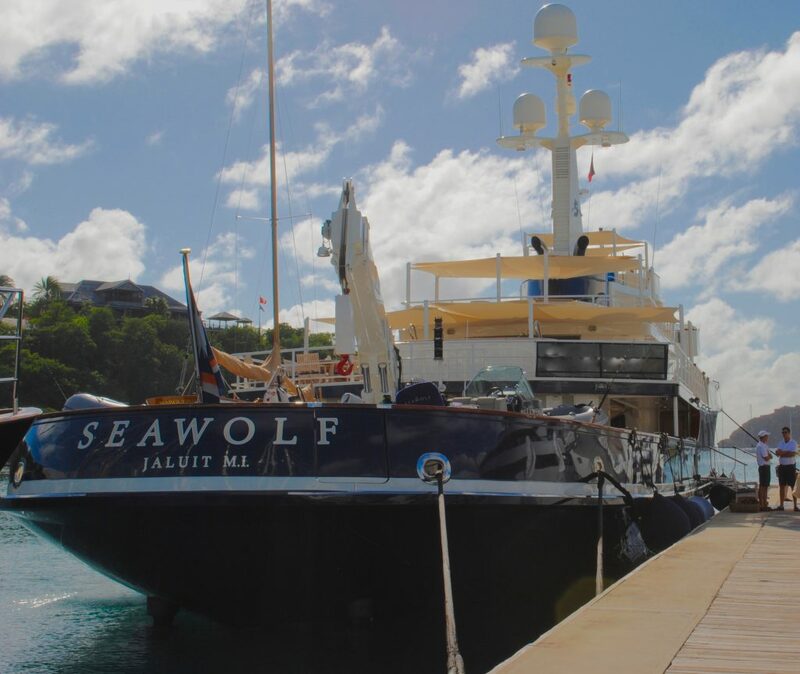 A true Expedition yacht, M/Y SEA WOLF, offers a lengthy amenity and water toys list including kayaks, diving equipment and a 28' ketch Hereschoff sailboat. 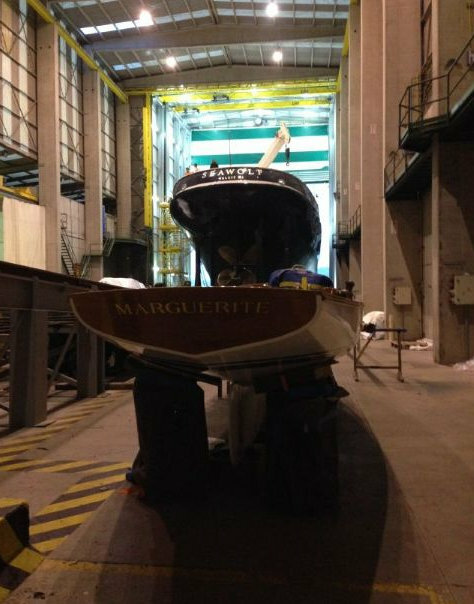 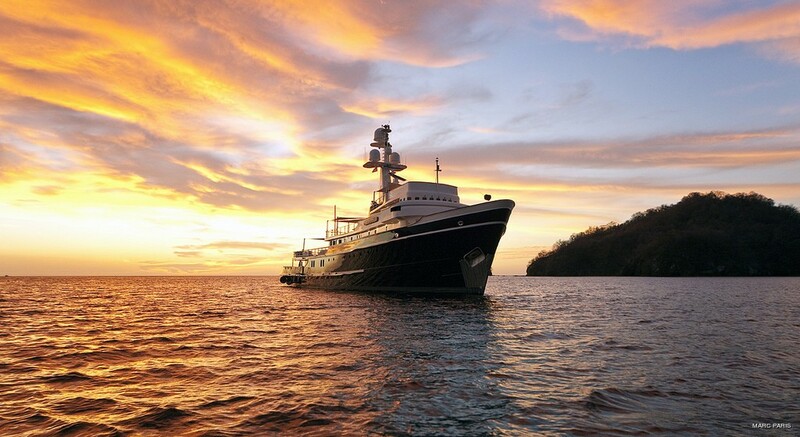 She also has the capacity for long-range cruising through any area that requires exploring. 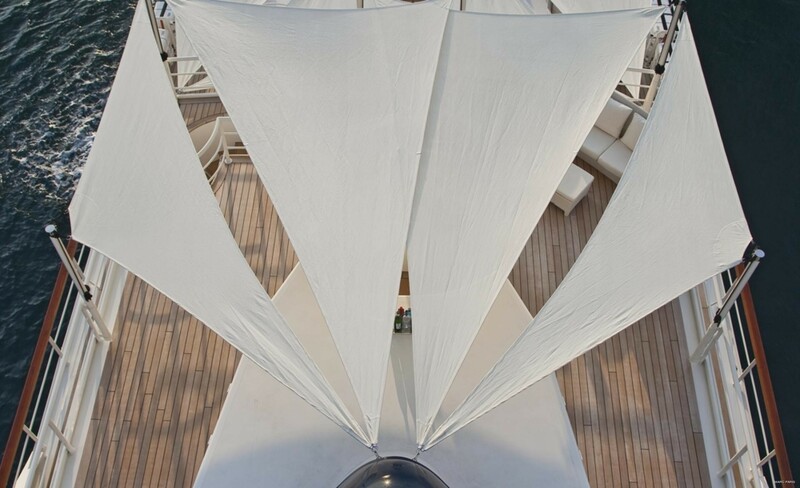 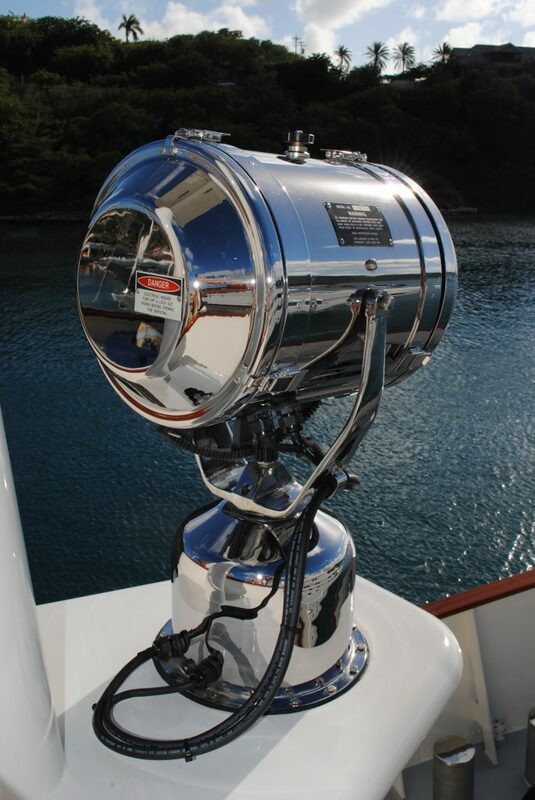 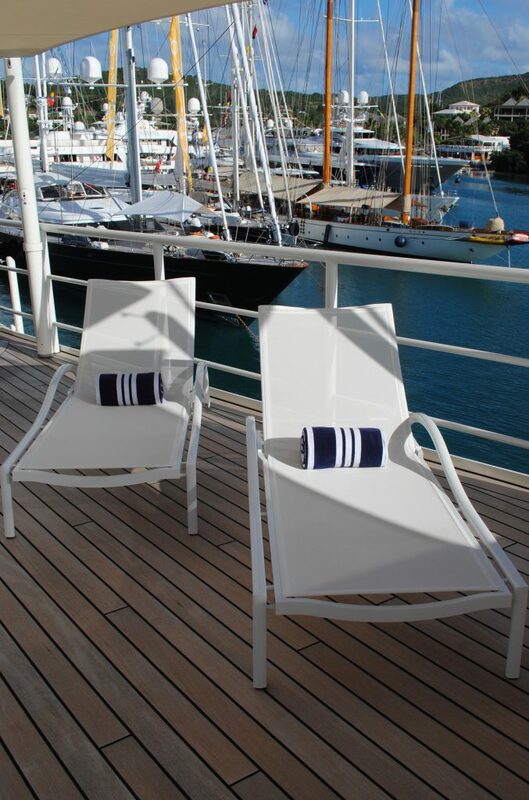 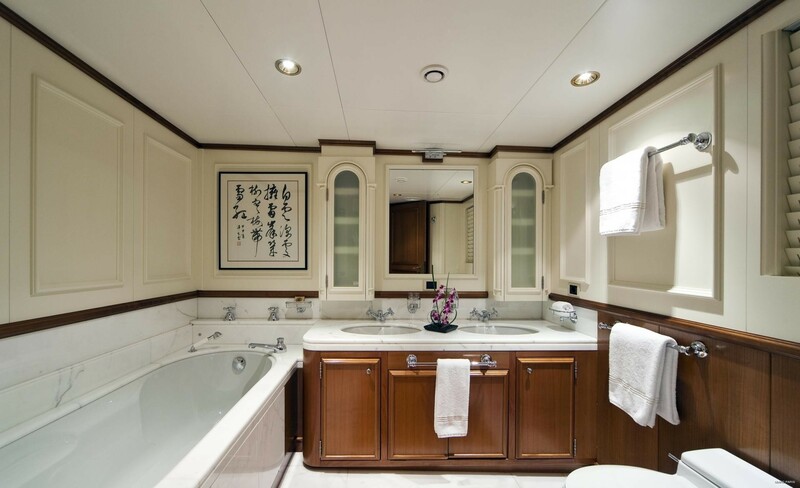 The luxuries of yachting have not been forgotten with large private cabins and ensuite bathrooms, contemporary electronics, a sundeck, wet bar and Spa Pool pool. 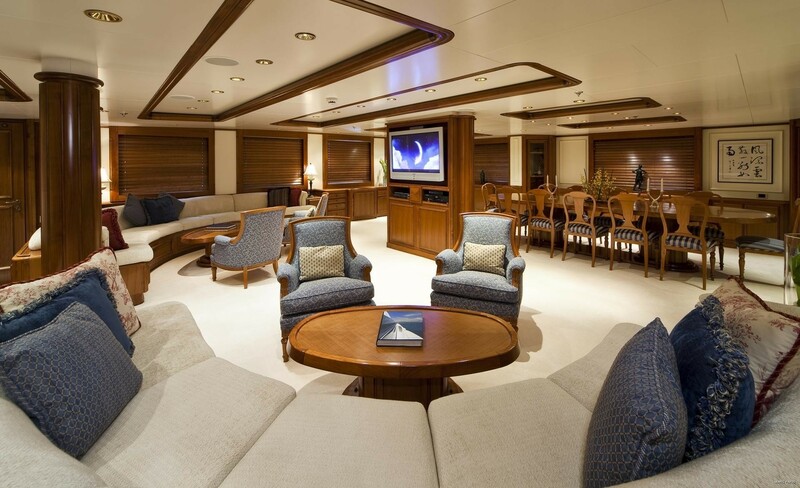 There is a grand main salon with a large flat screen TV with MX 3000 remote system and surrounds sound. 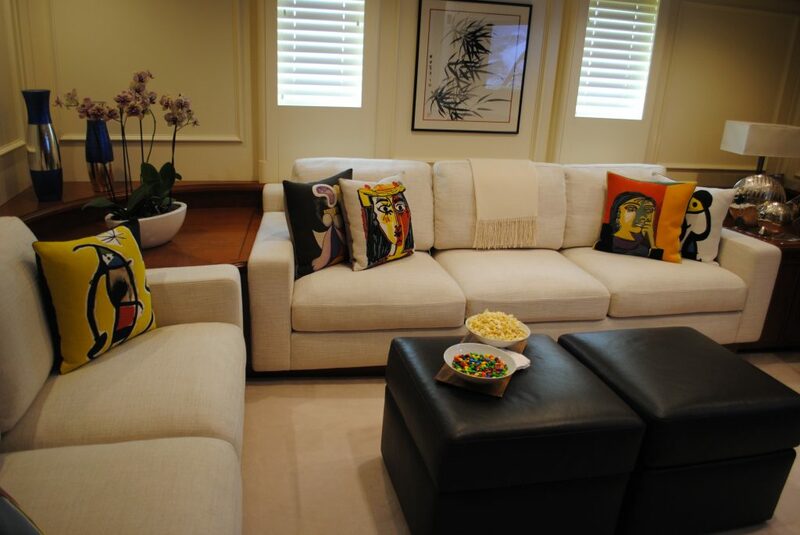 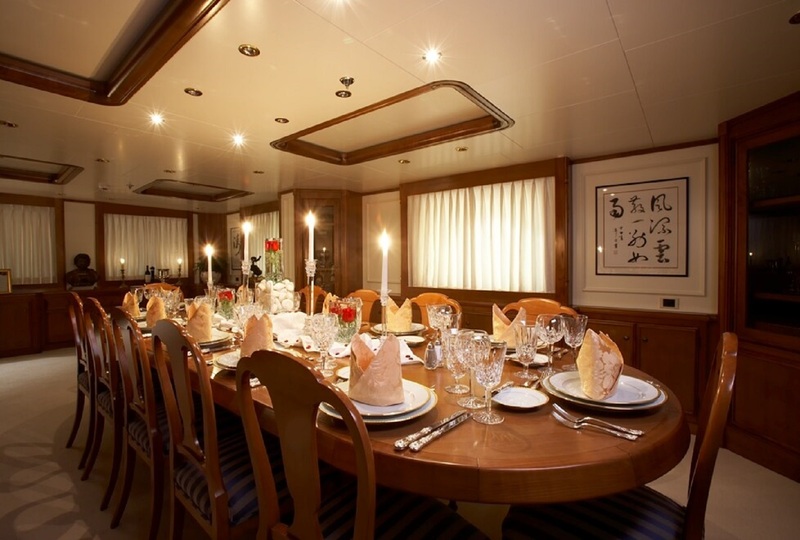 Adjoining the main salon is also a formal dining area seating 12 guests. 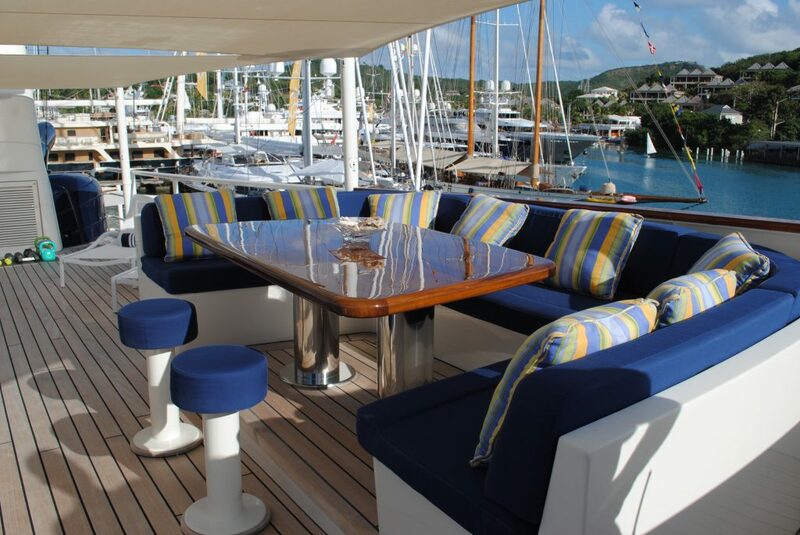 On her main deck aft, SEAWOLF offers covered alfresco dining for 12 guests as well casual seating and a 50” flat screen TV with surround sound. 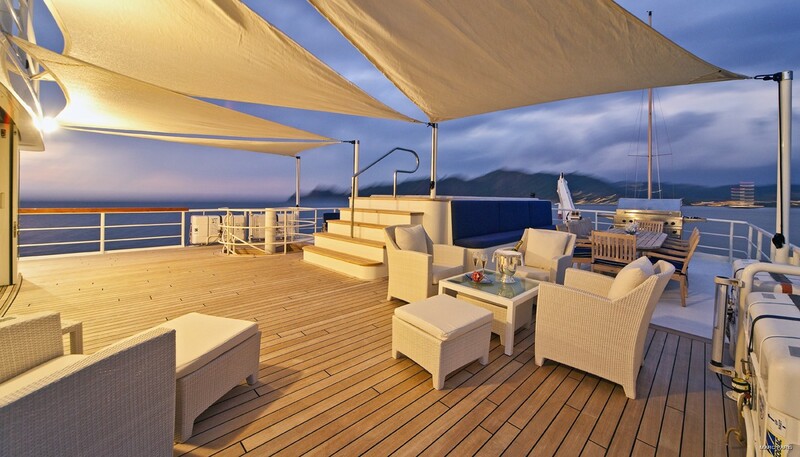 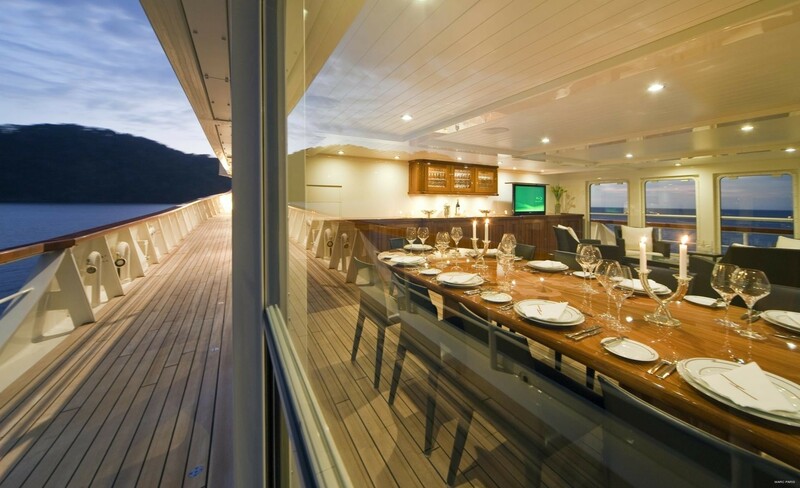 Her upper deck aft also has covered alfresco dining with two tables seating six guests each, and a 360ºswivel 50” Flat screen TV with surround sound. 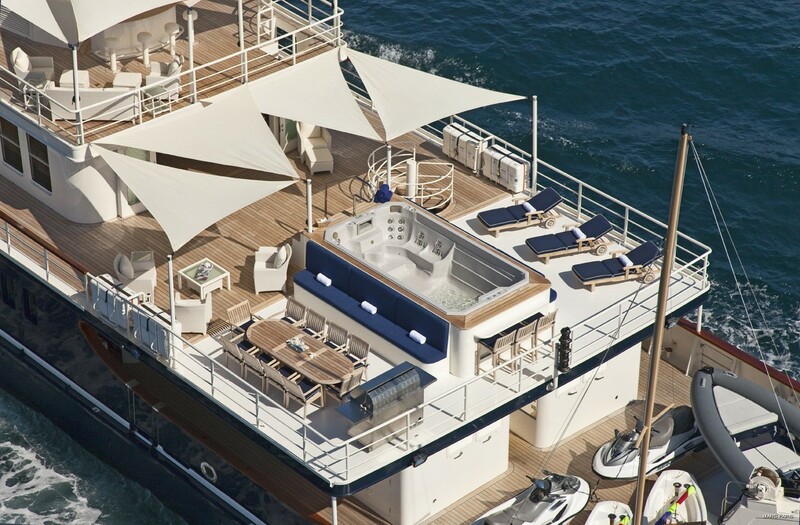 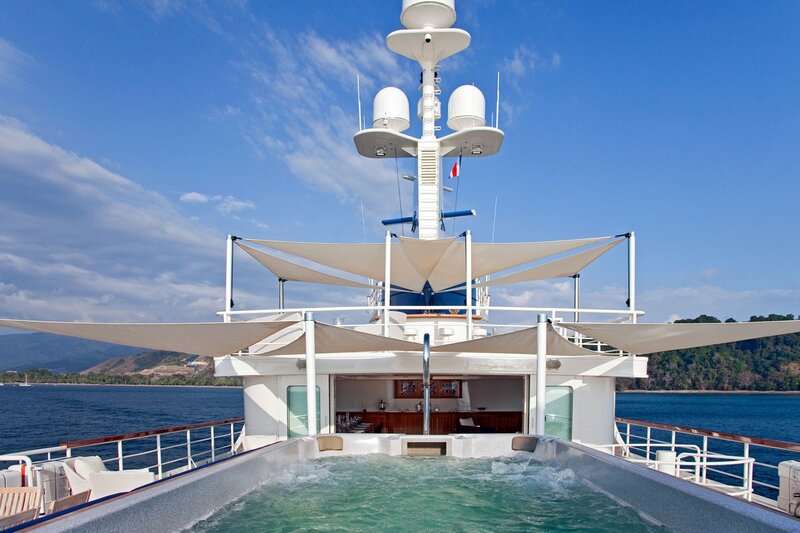 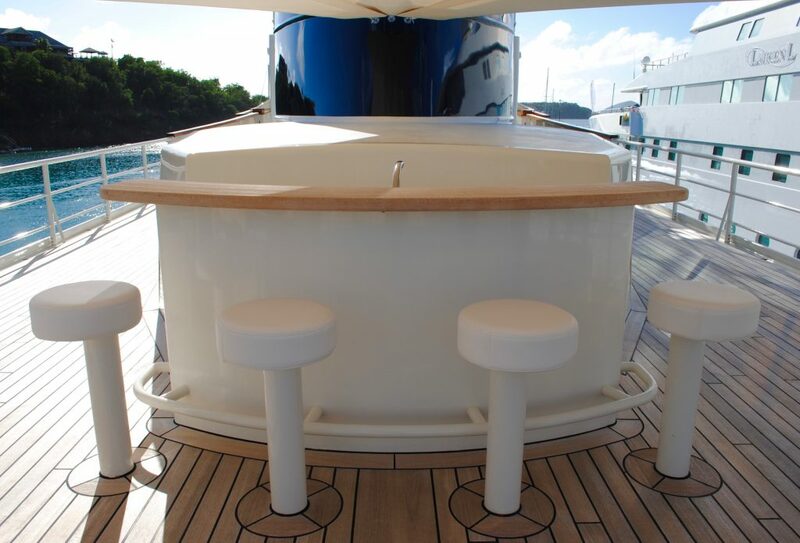 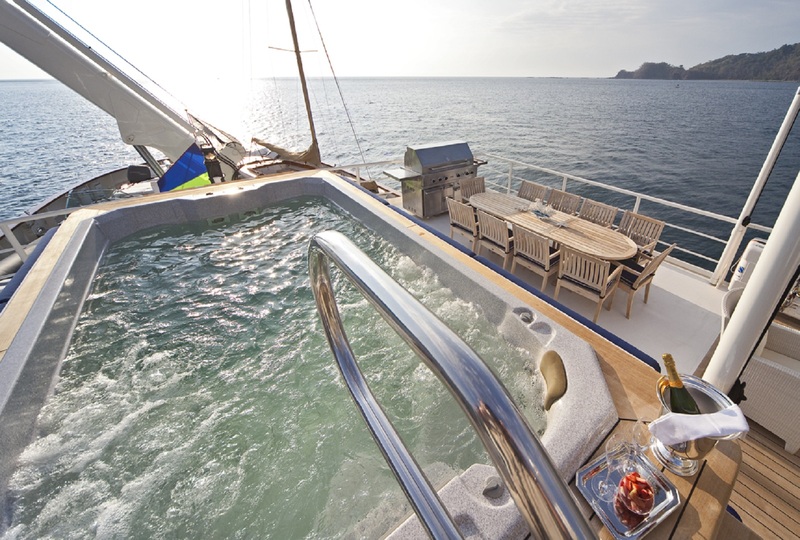 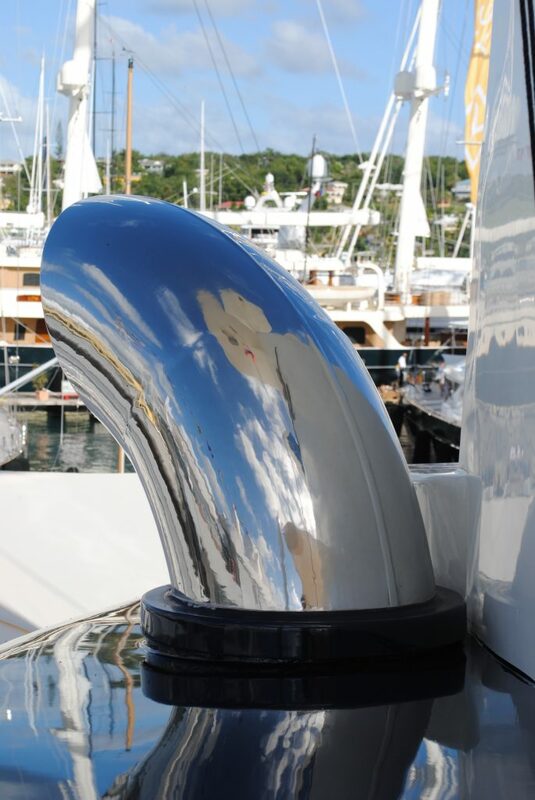 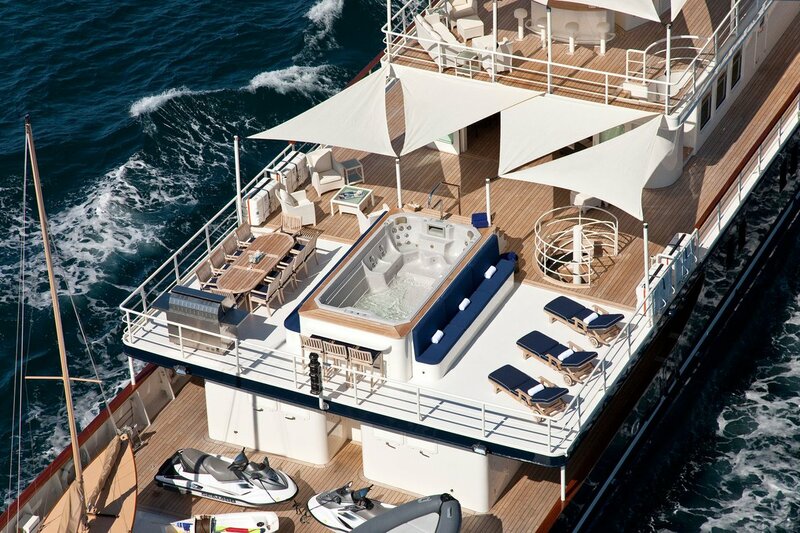 One of the yachts fantastic features is her 17’X 9’ swimming pool with resistance & Spa Pool jets. 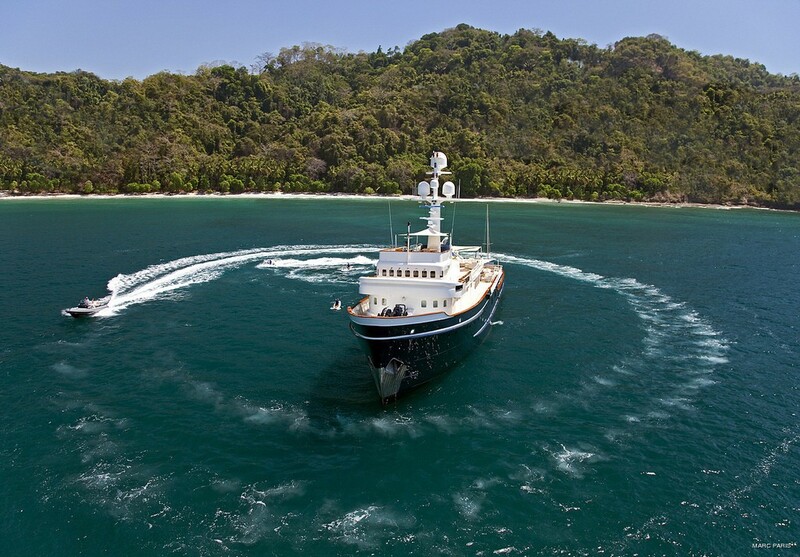 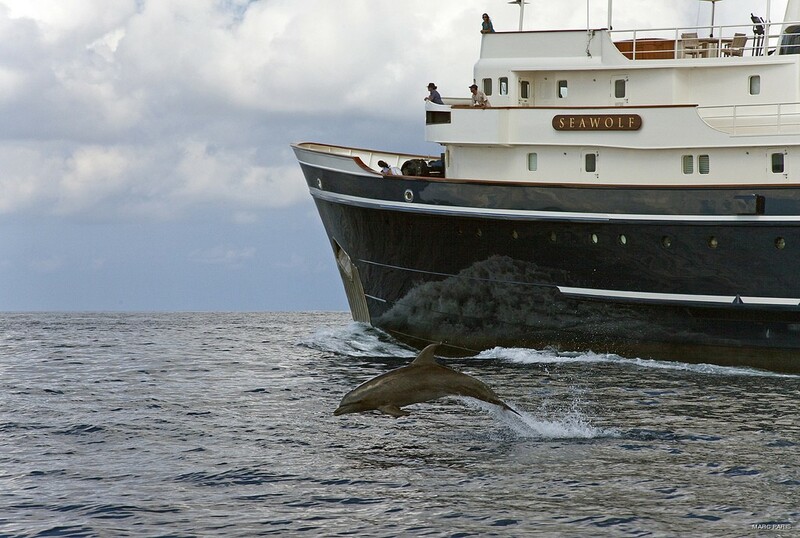 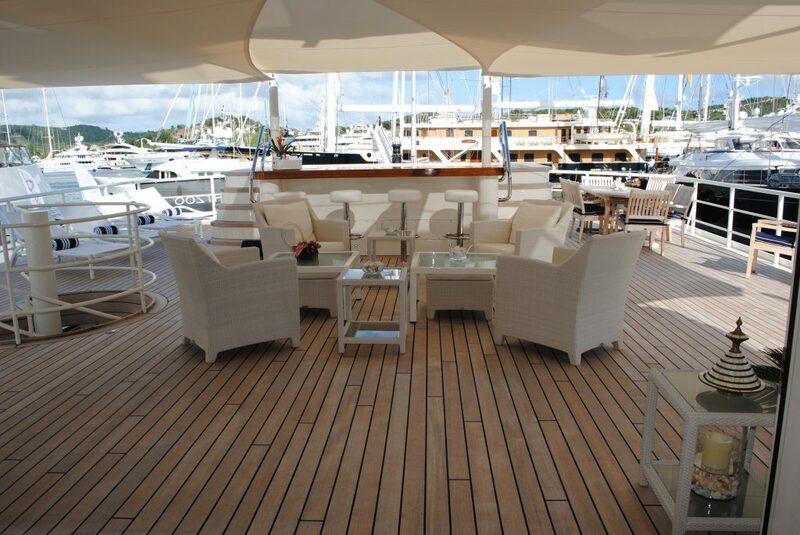 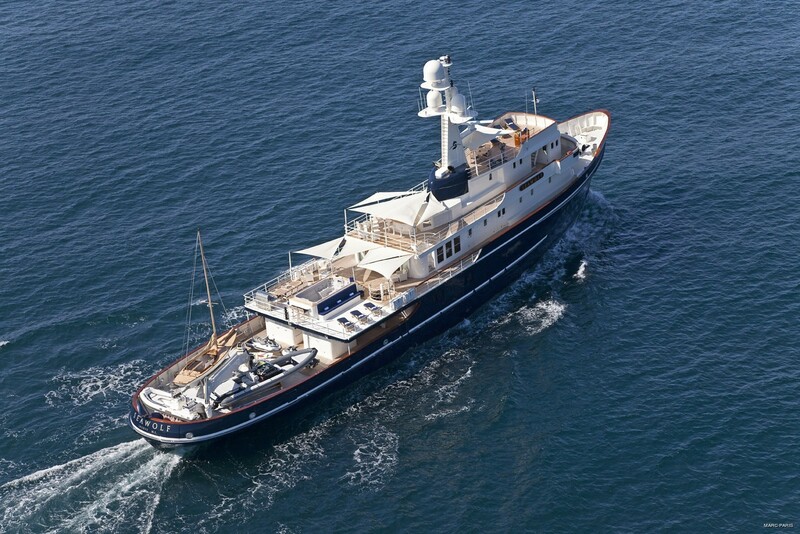 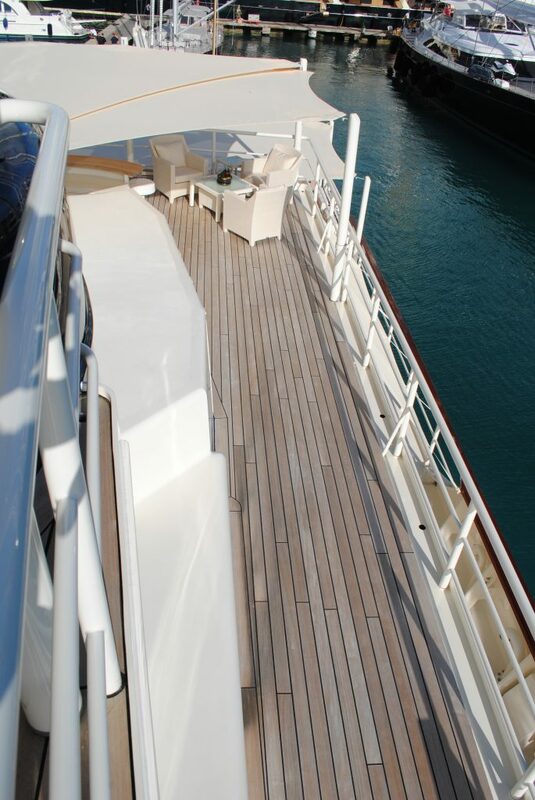 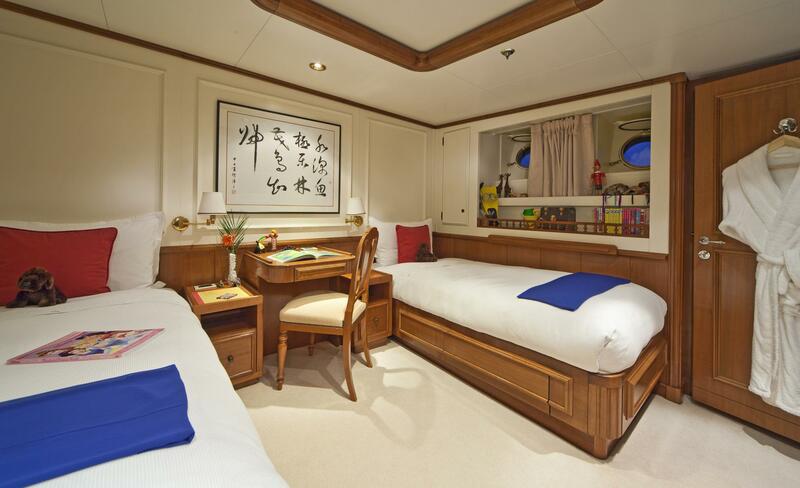 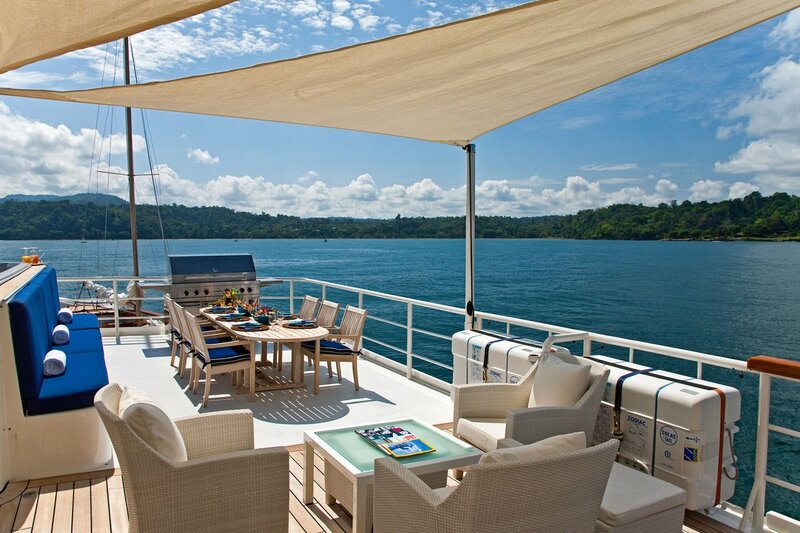 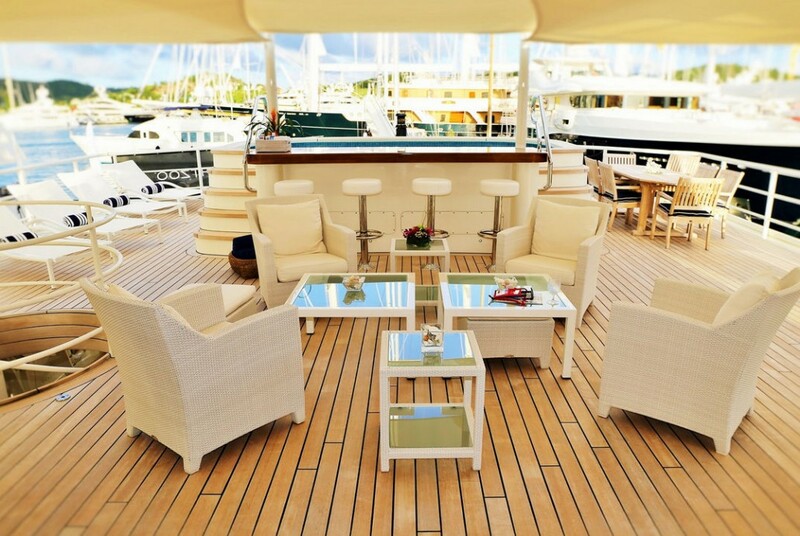 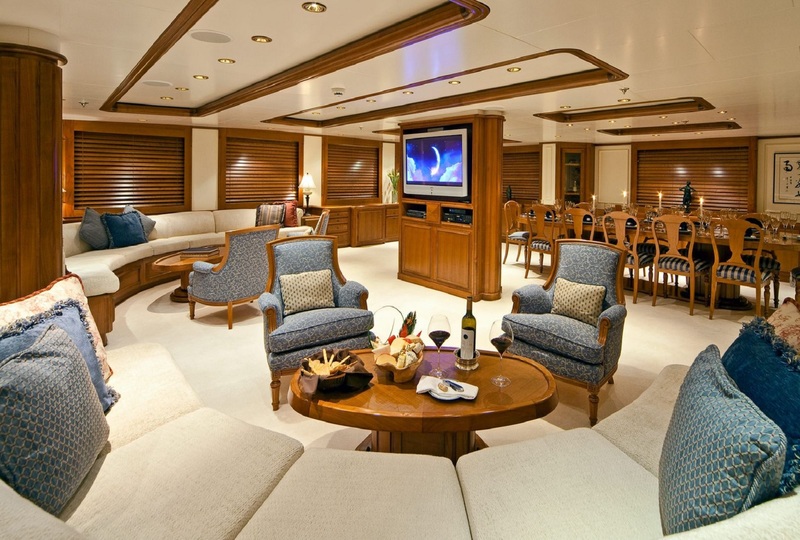 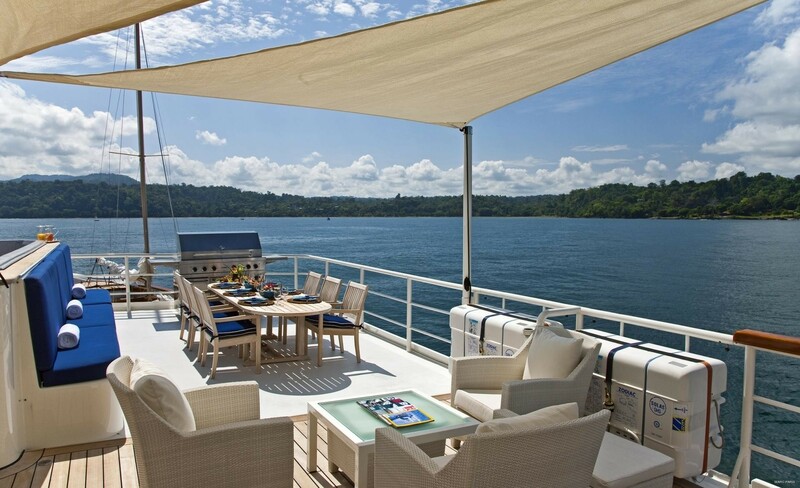 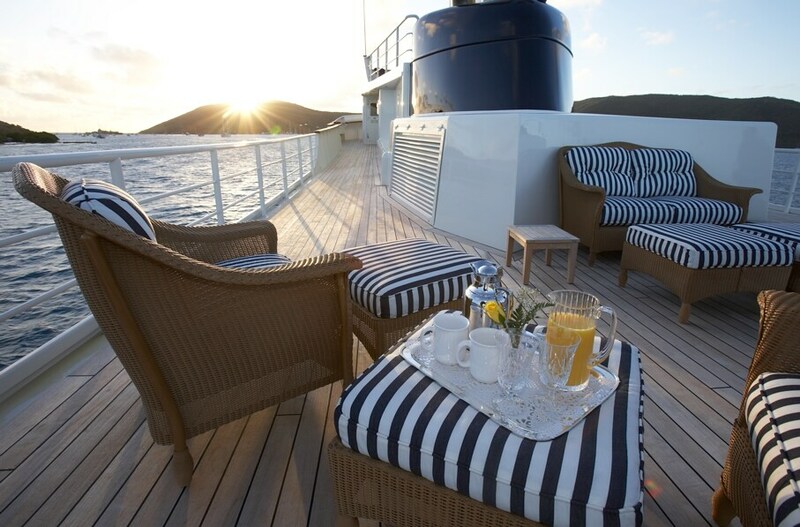 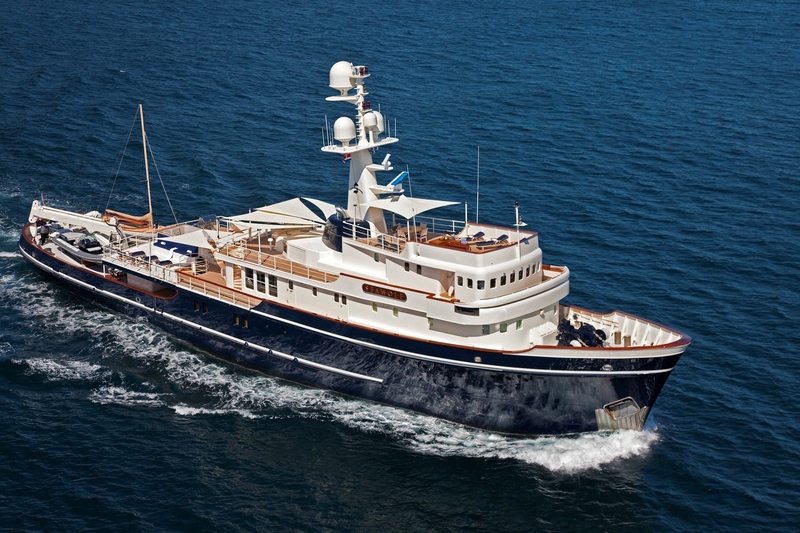 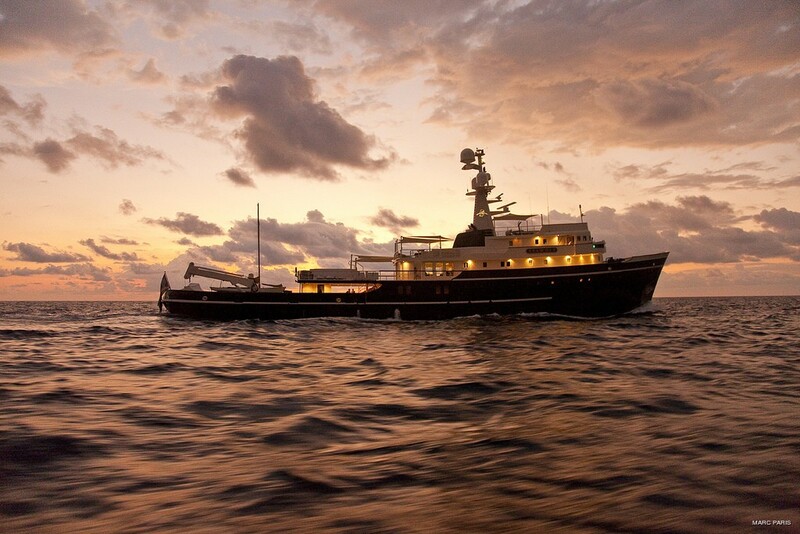 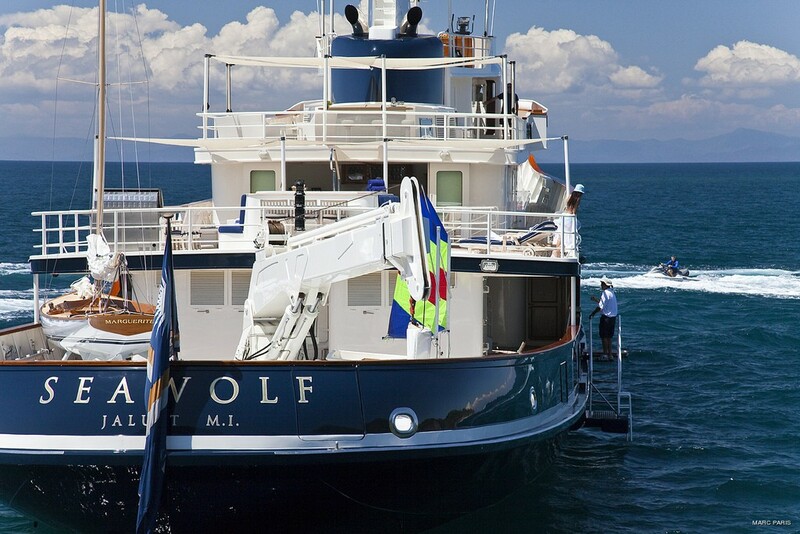 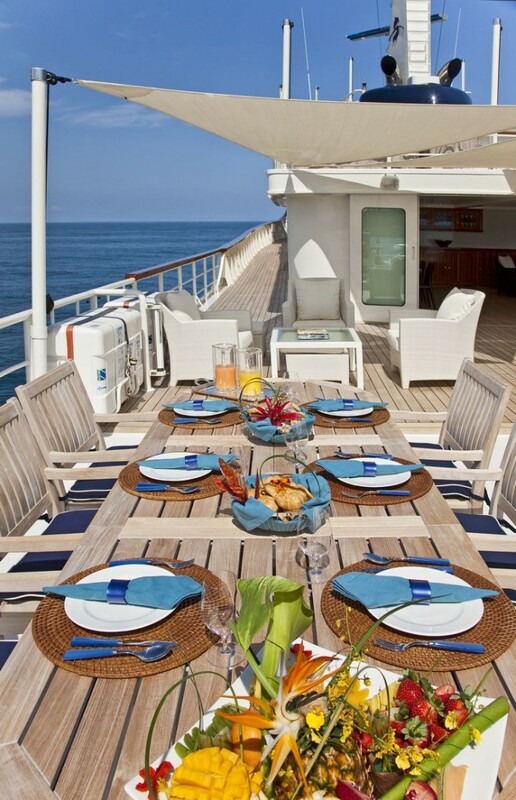 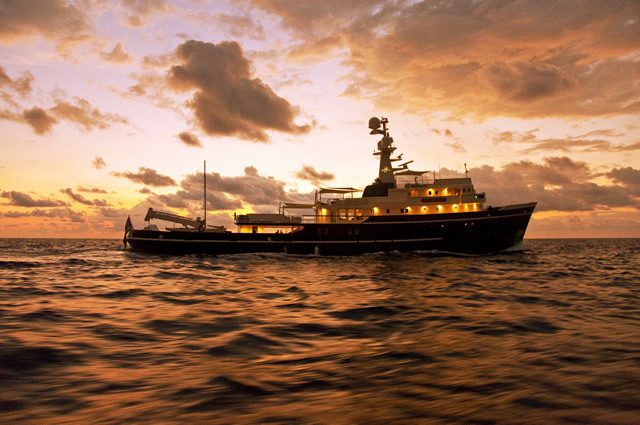 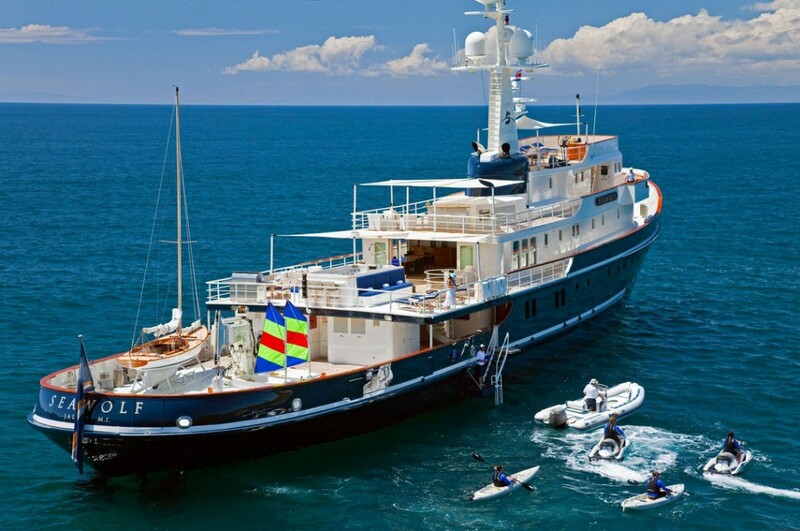 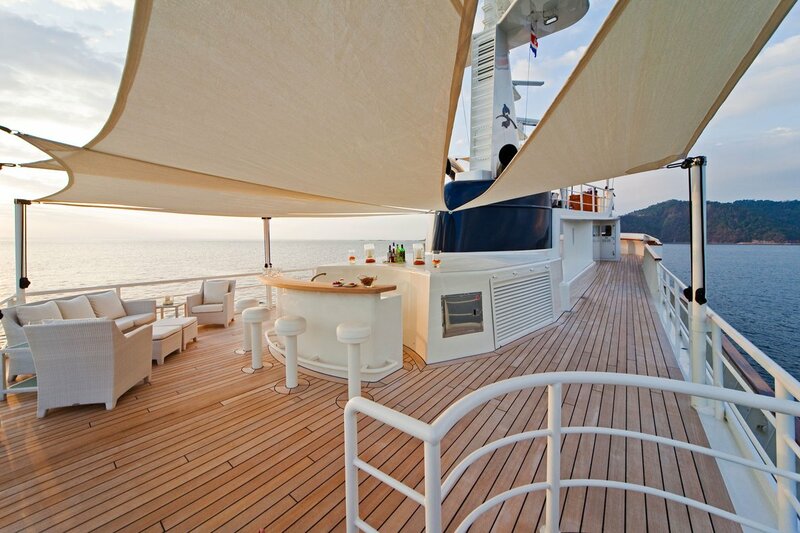 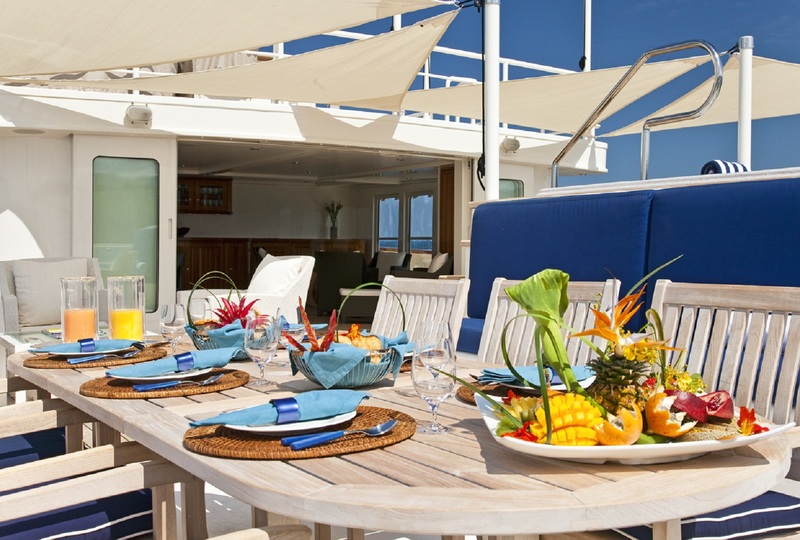 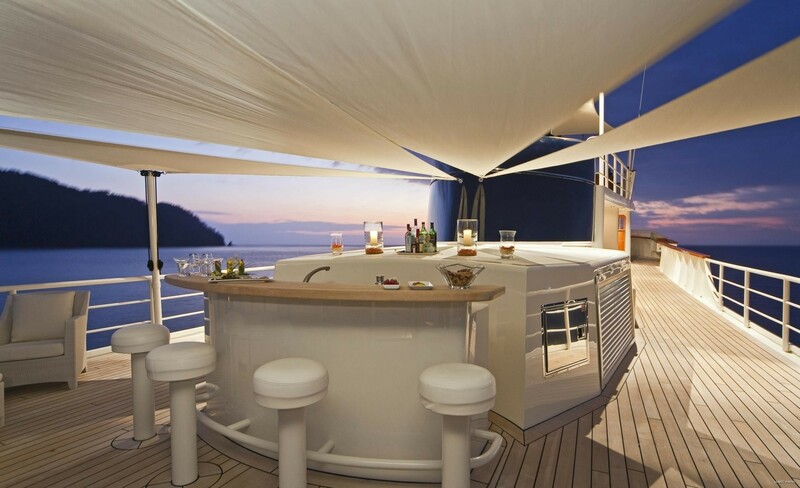 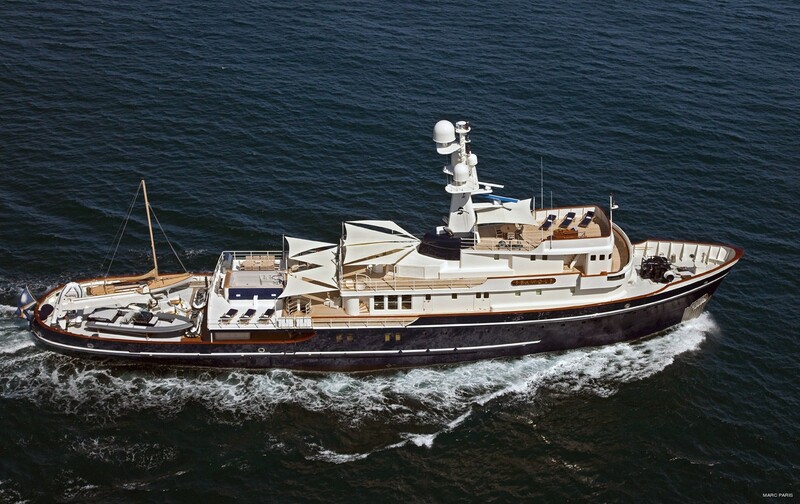 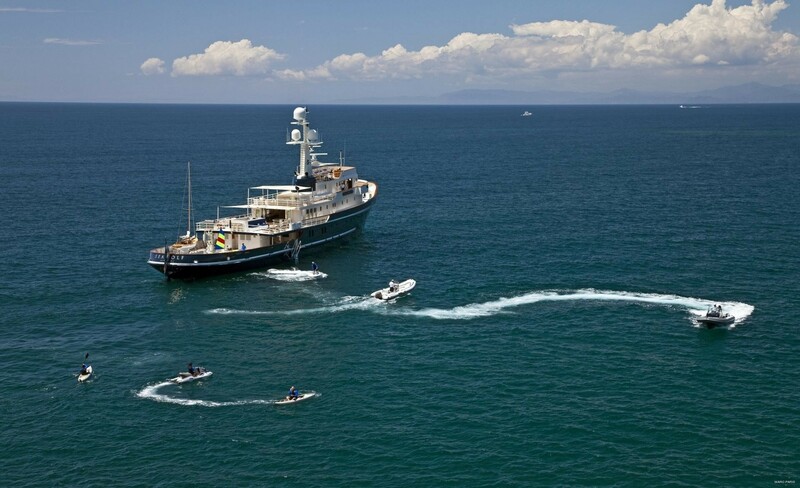 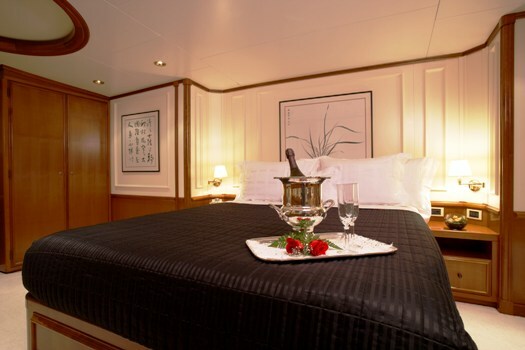 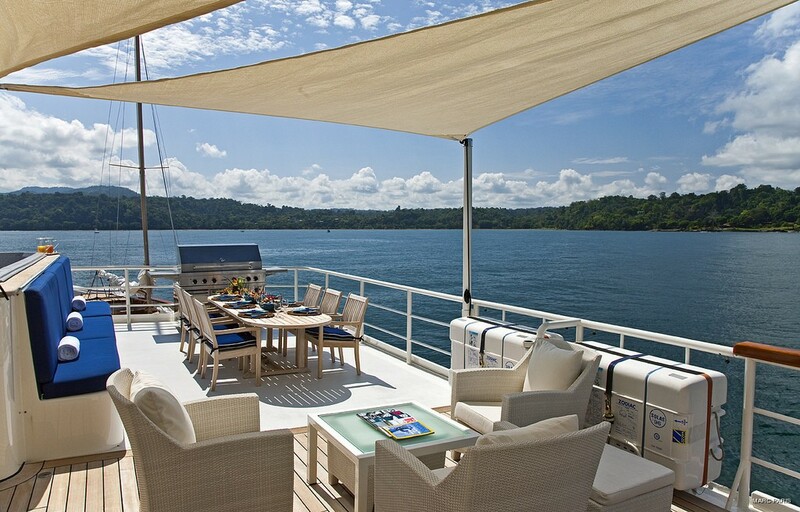 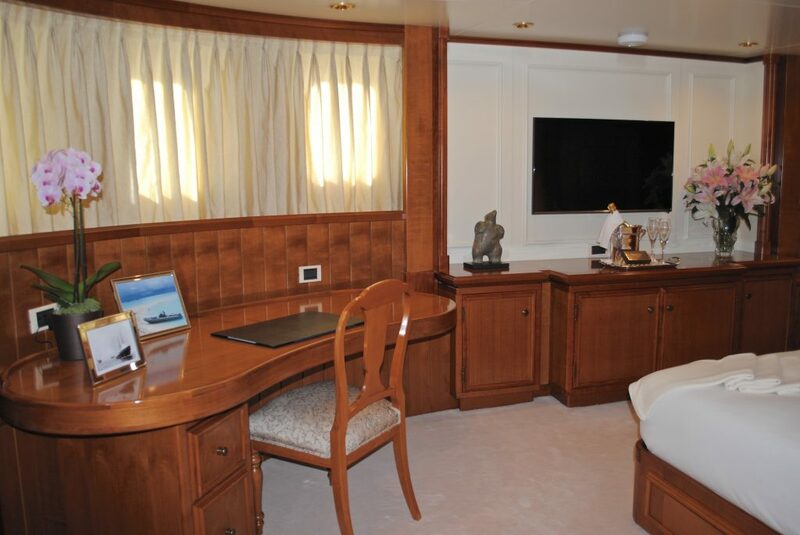 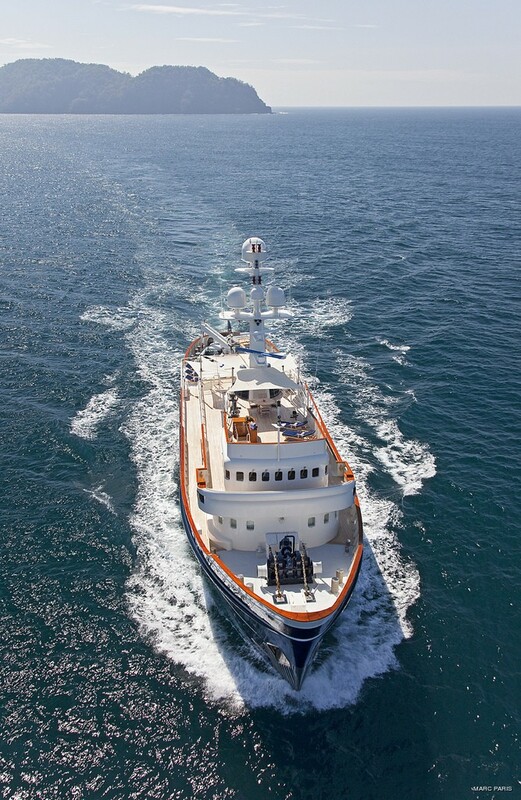 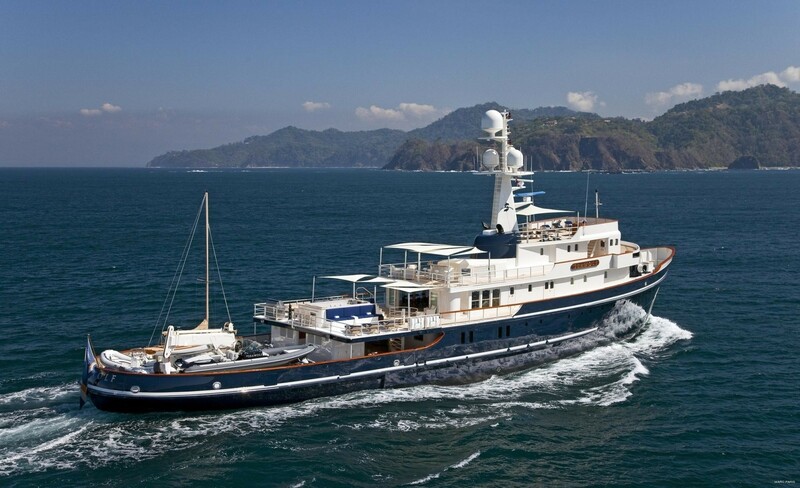 Luxury motor yacht SEAWOLF can accommodate a total of 12 guests in 6 staterooms. 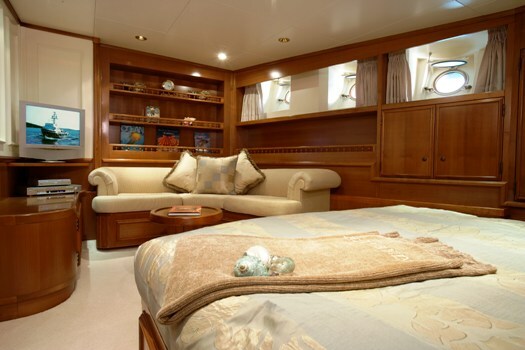 The master suite which is located on the upper deck has a private salon with a large flat screen TV with a MX 3000 remote system and two zone surround sound. 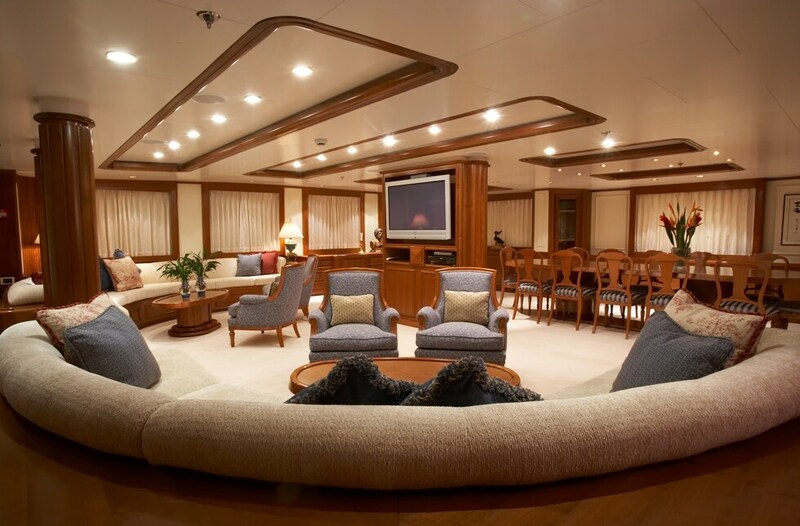 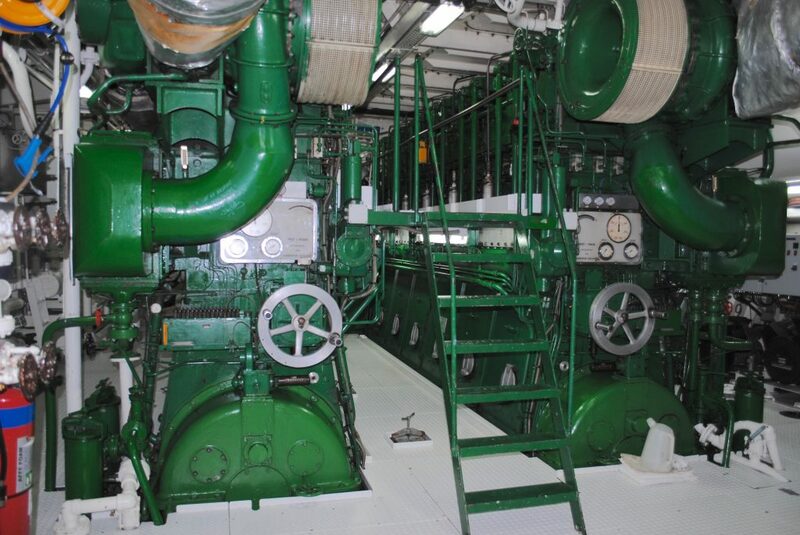 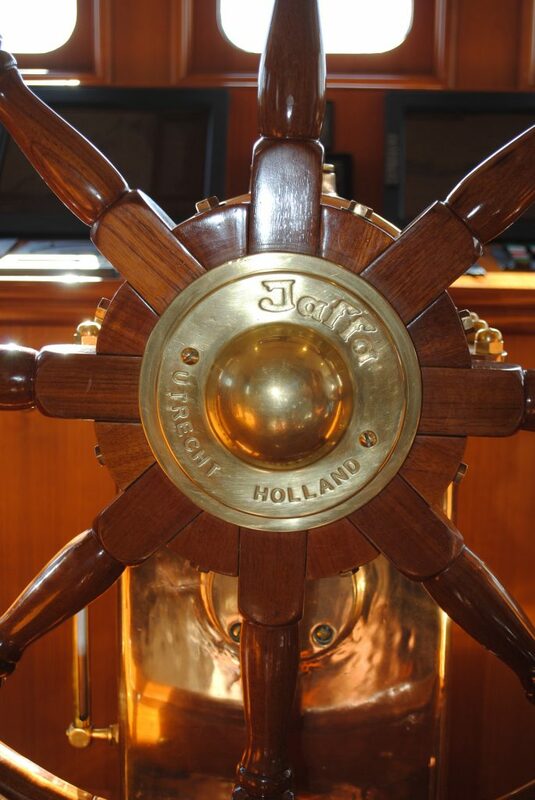 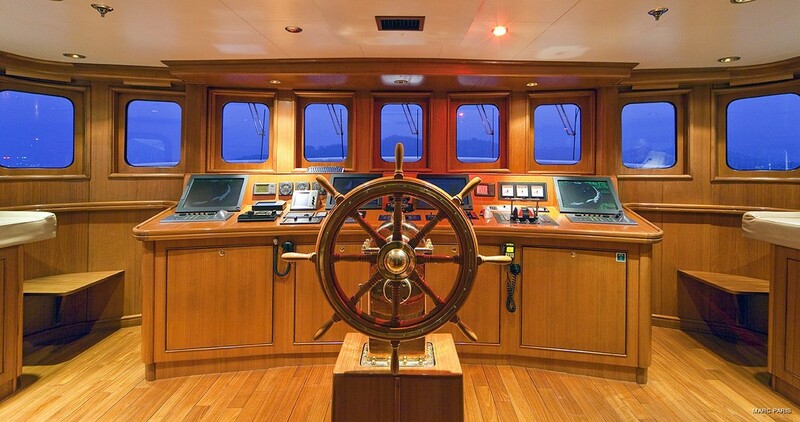 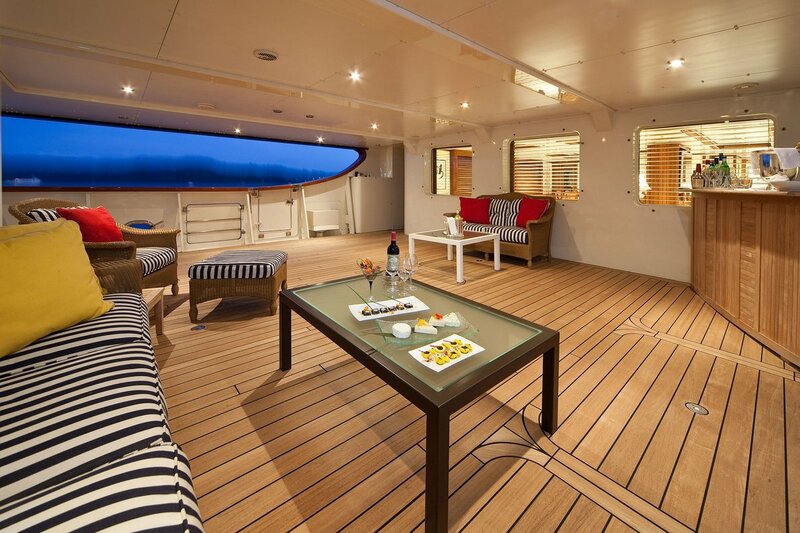 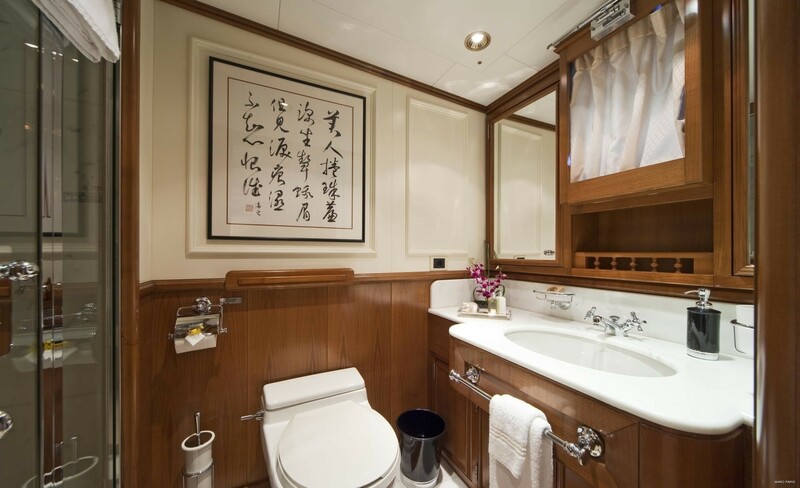 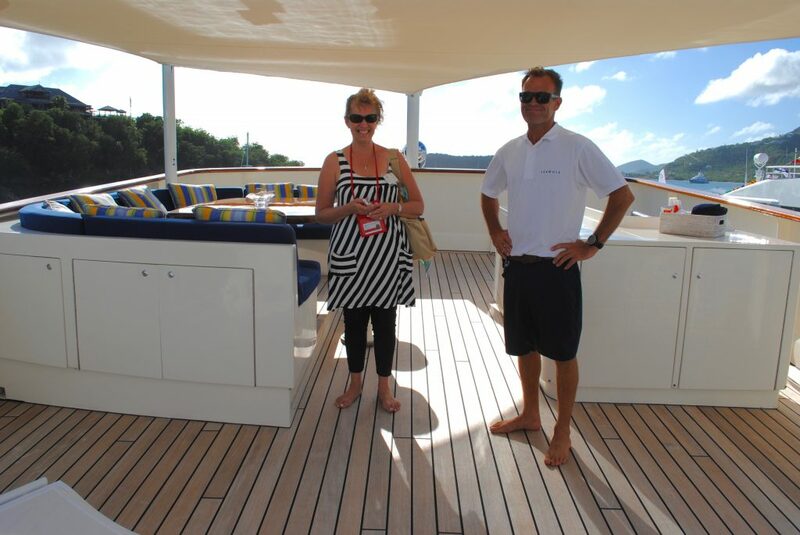 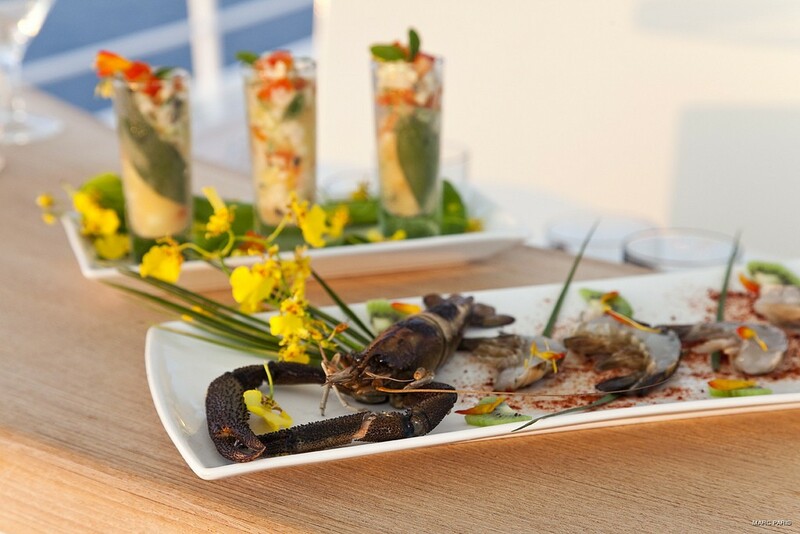 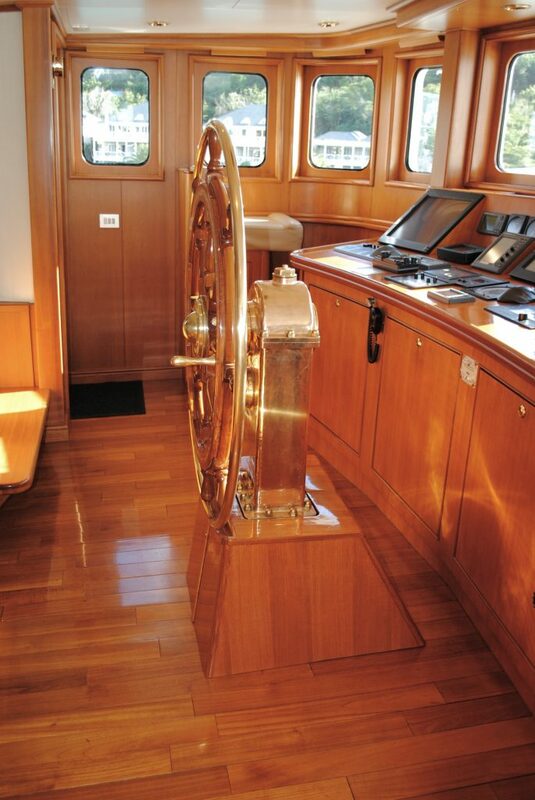 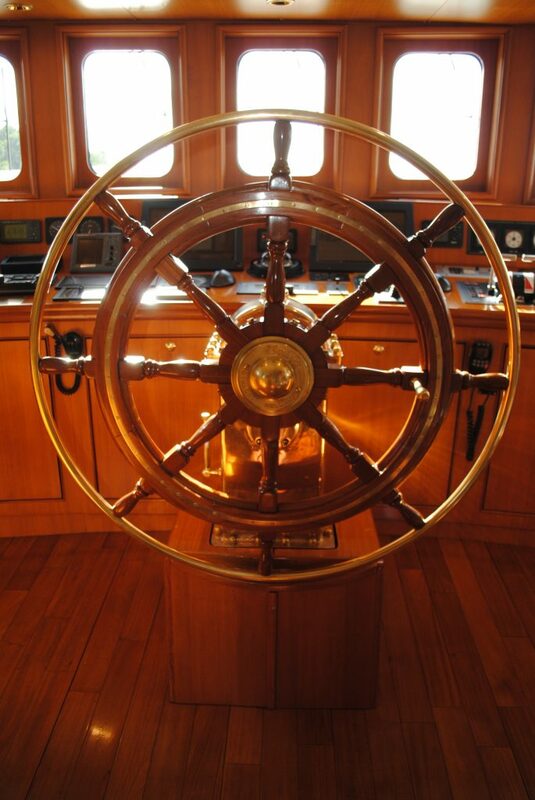 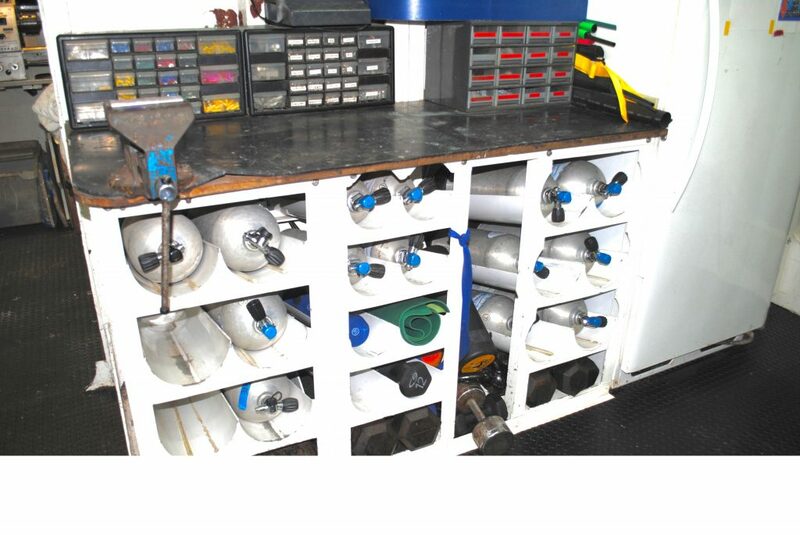 The master cabin not only has private dining for 4 guests but also a private galley. 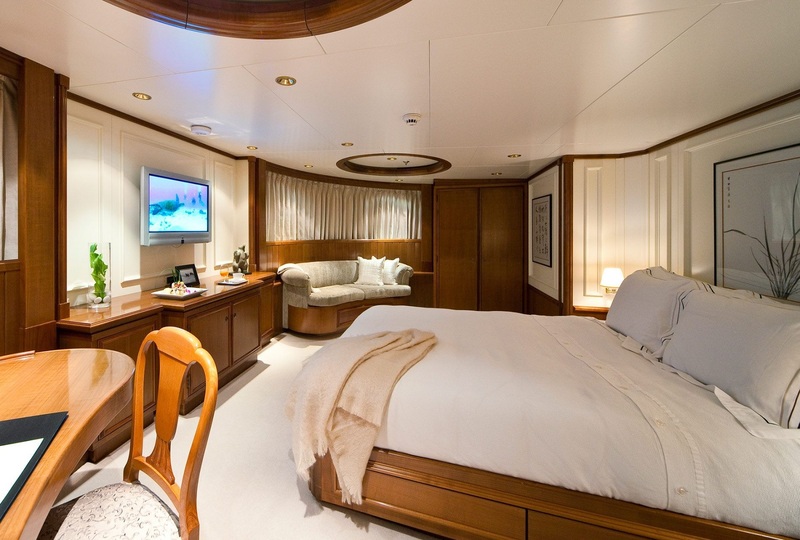 The bed is a huge Olympic queen which measures 80” by 60” and her ensuite bath with shower has his and hers sinks with a separate powder room. 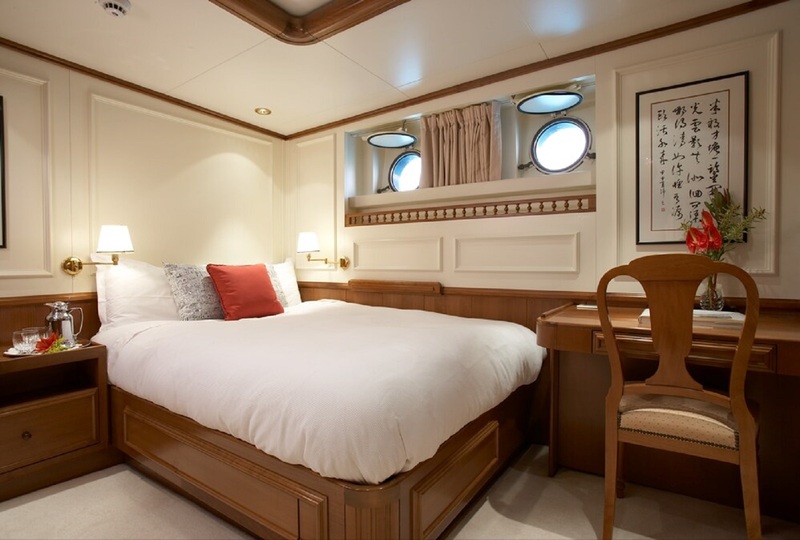 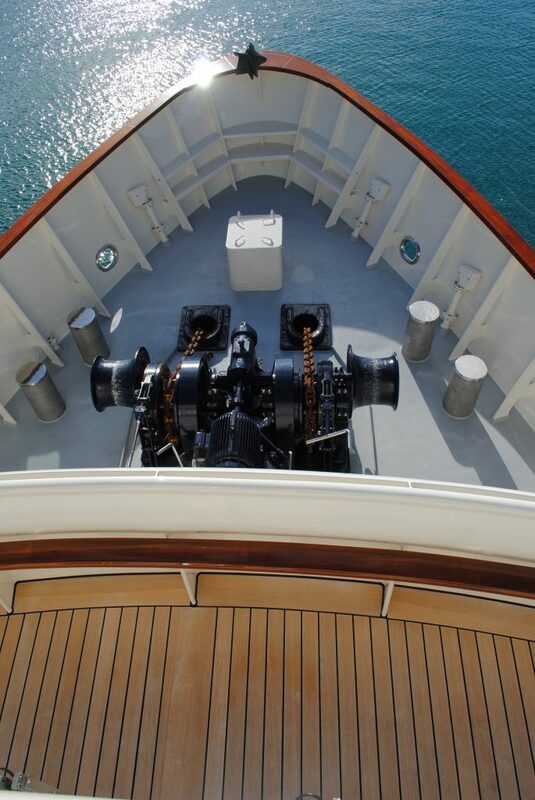 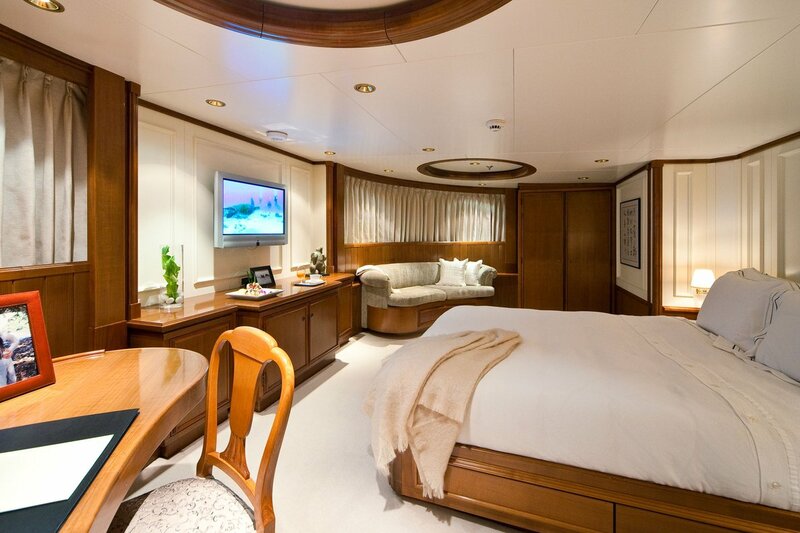 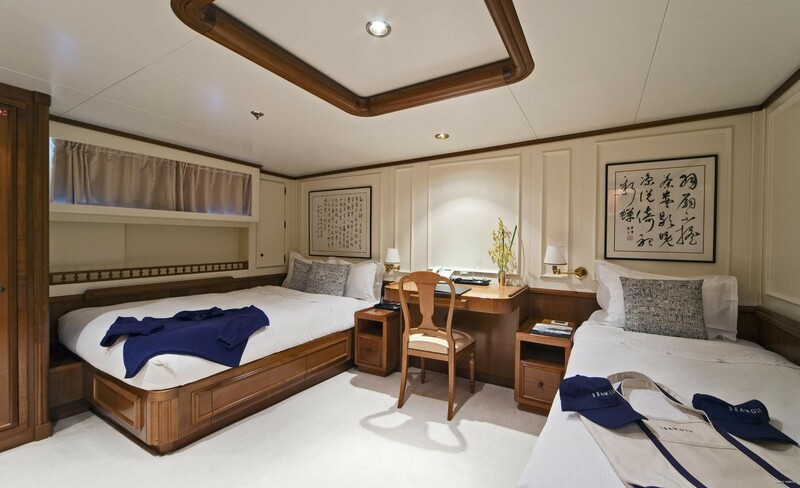 On the main deck there is a full beam VIP Suite with an Olympic Queen bed measuring 80” by 60”, an office area and an ensuite shower. 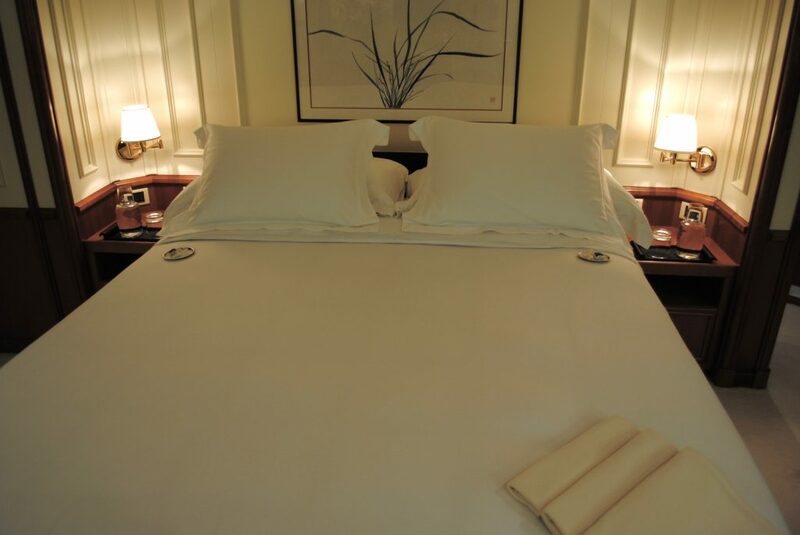 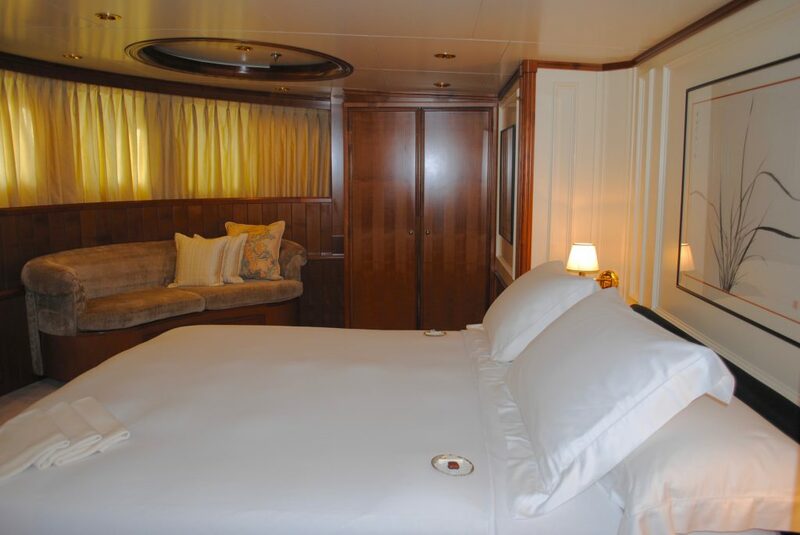 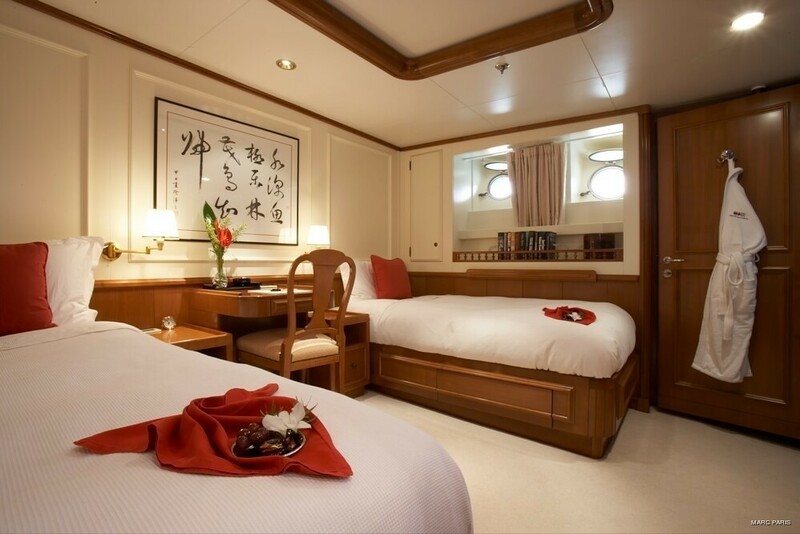 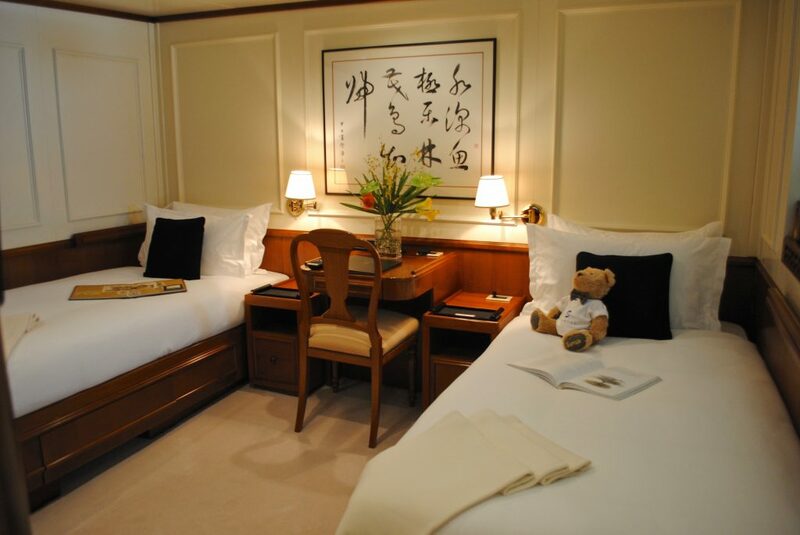 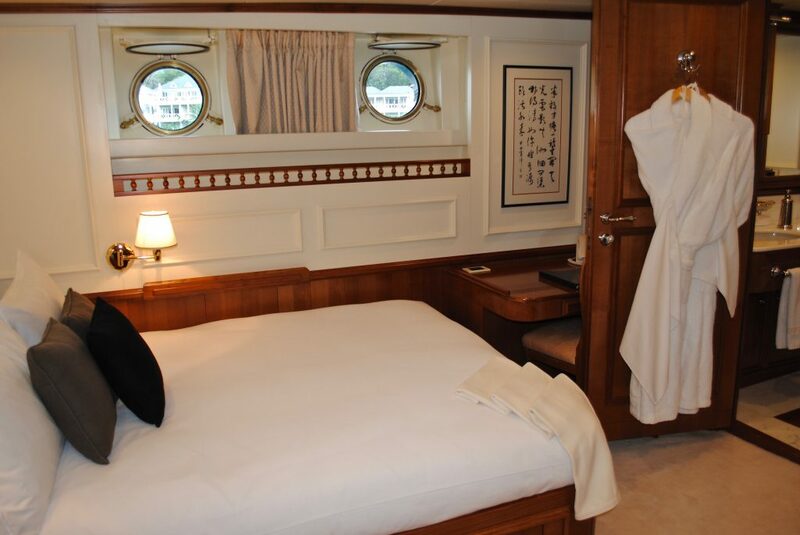 The remaining guest rooms on the main deck consist of 2 European queens suites with beds measuring (78”x58”) d two twin cabins all with ensuite facilities and flat screen TV/DVD/CD. 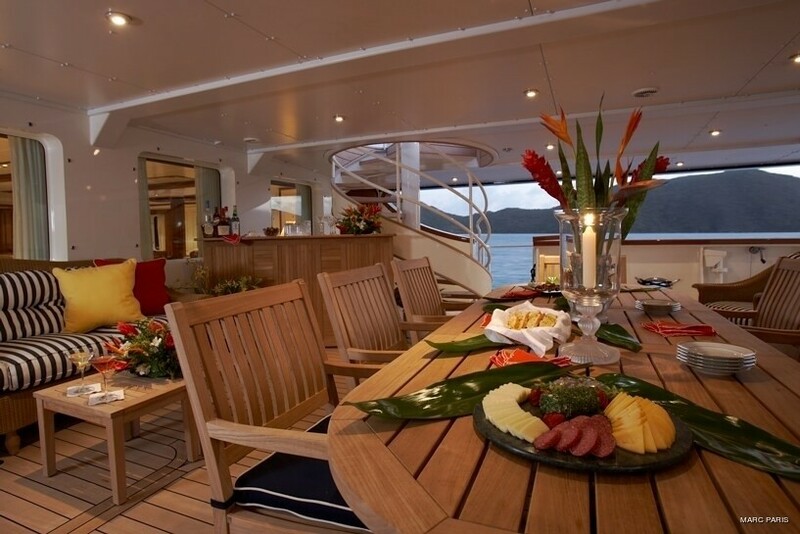 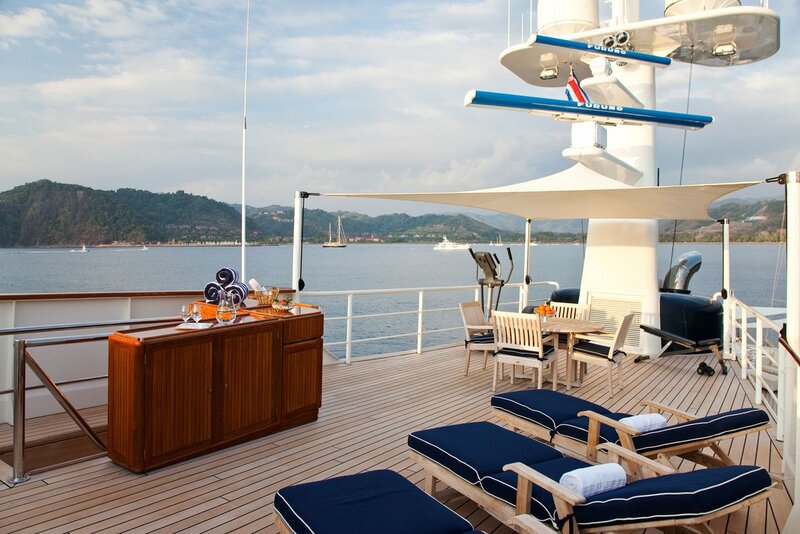 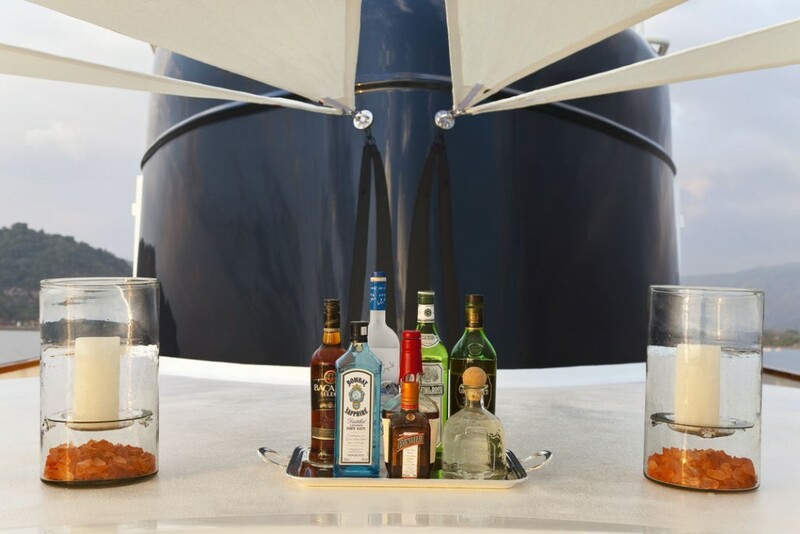 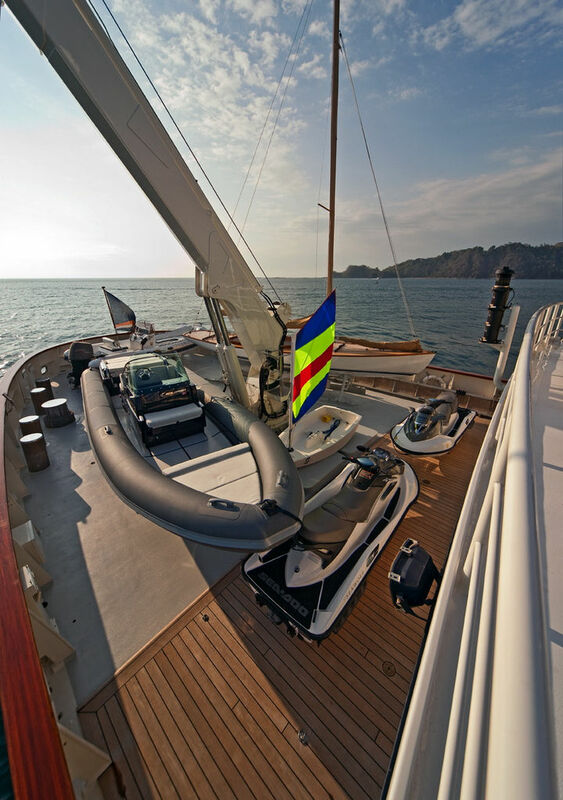 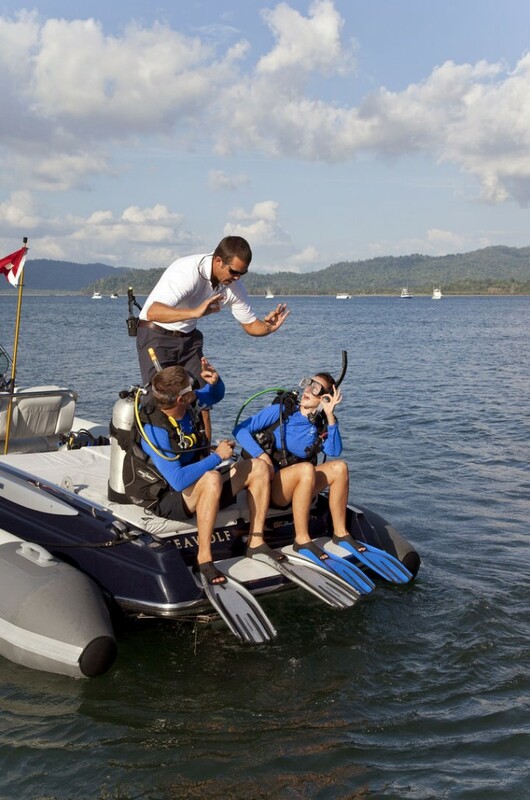 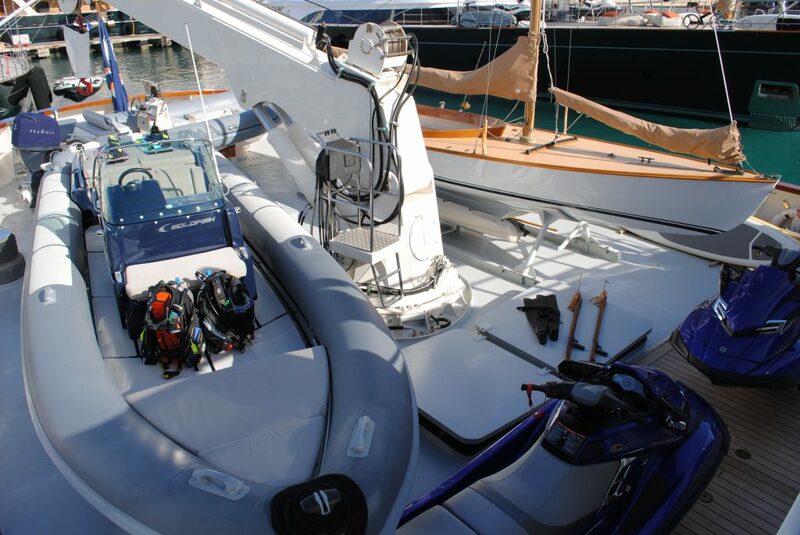 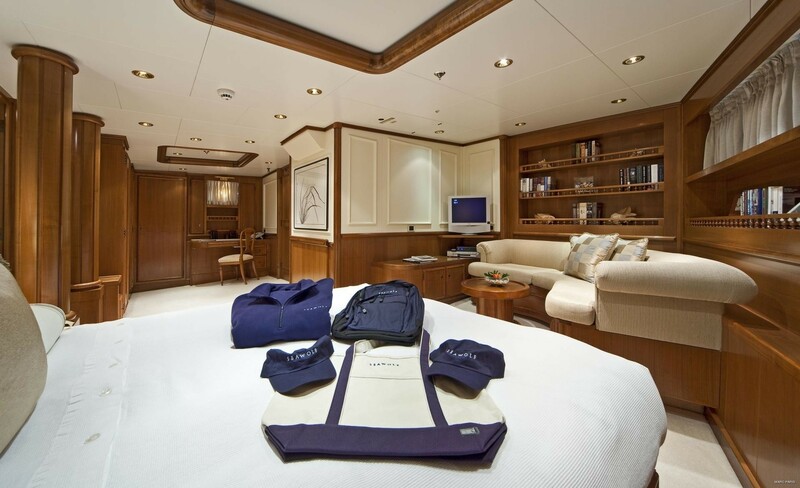 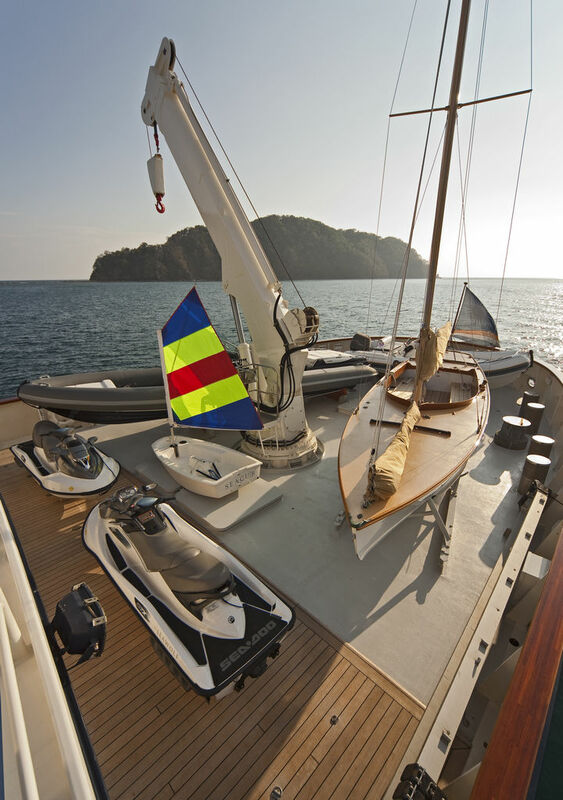 Luxury motor yacht SEAWOLF has the following extras and amenities on board. 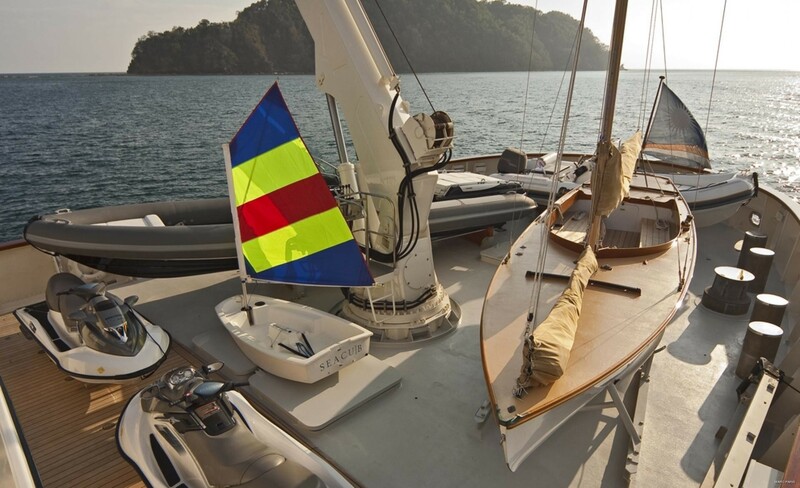 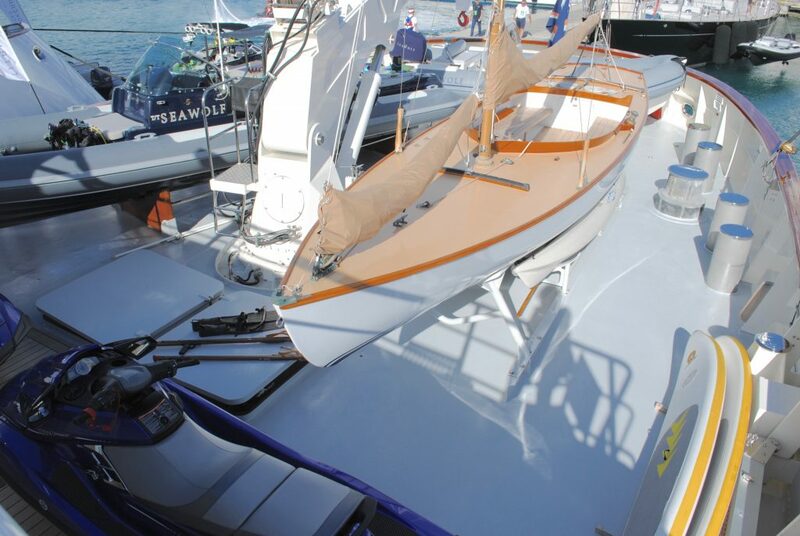 Her tenders and toy selection includes a 23 ft (7.01 m) BWA with two 120hp twin diesel engines, a 19 ft (5.79 m) BWA with a 90hp outboard, a28' ketch sailboat Hereschoff to be skippered by a crewmember, two 2 man waverunners, two 2 man kayaks, extensive big-game fishing equipment, snorkelling gear, 2 wakeboards, water skis, an assortment of inflatable’s, dive equipment including 9 full sets with onboard compressor with unlimited air supply. 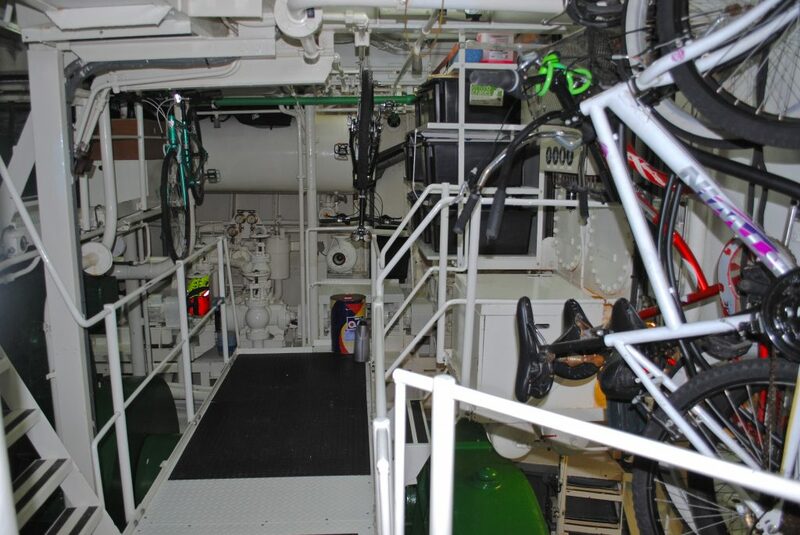 Her communications include SKYPE, VIOP, VSAT, and Wifi areas throughout.